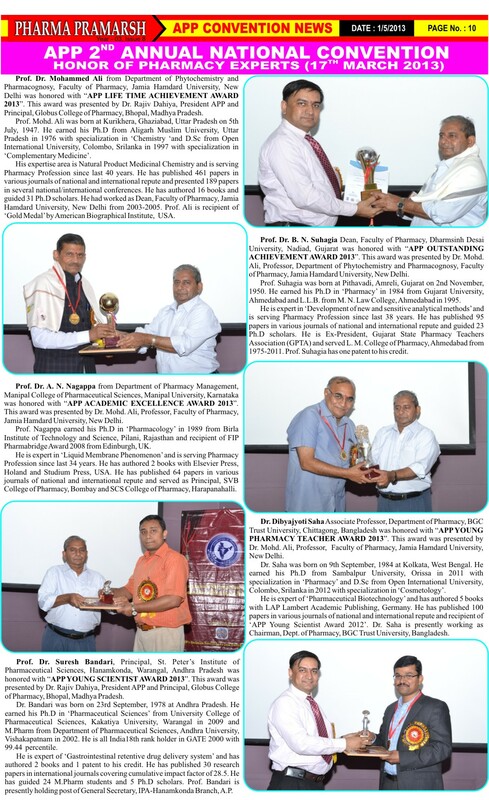 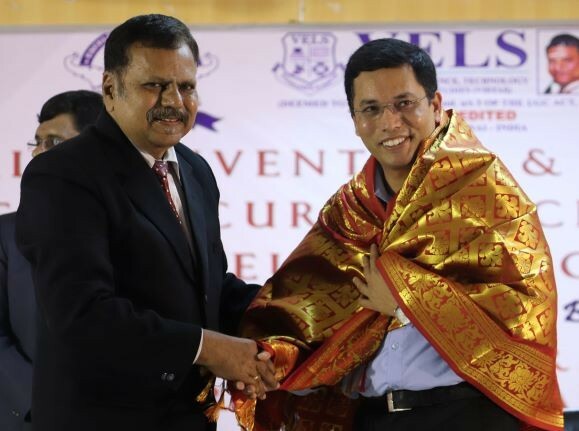 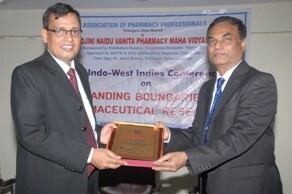 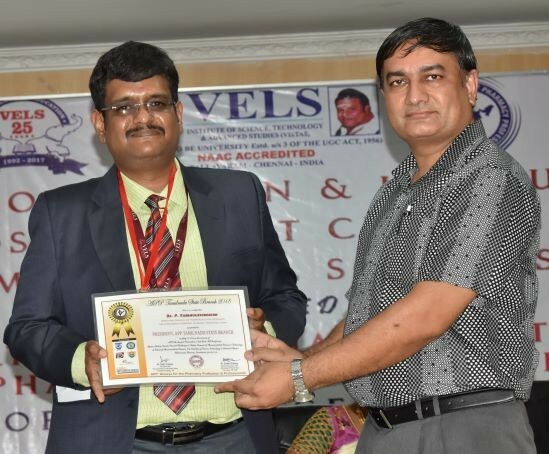 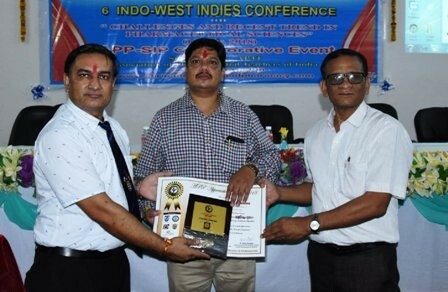 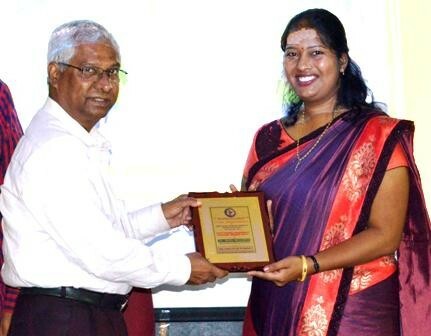 7th Annual Convention of Association of Pharmacy Professionals & 2nd Indo-US Conference on “Modern Trends, Current Challenges and Future Scenario of Pharmaceutical Sciences and Technology” was organized and hosted by School of Pharmaceutical Sciences, Vels Deemed to be University (VISTAS), Pallavaram, Chennai, Tamilnadu on 27th July 2018, in collaboration with APP West Indies International Branch. 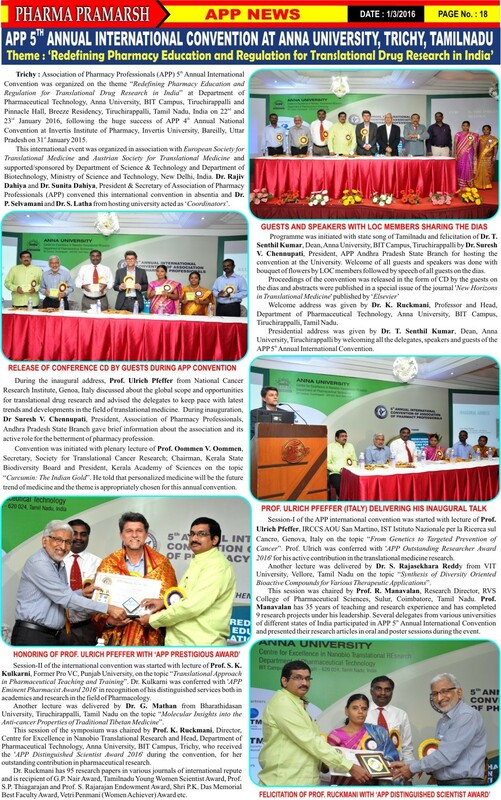 This APP-VISTAS collaborative conference was witnessed by Dr. Ishari K. Ganesh, Chancellor, VISTAS, Pallavaram as ‘Chief Patron‘; Prof. P. Swaminathan, Vice-Chancellor, VISTAS as ‘Patron‘; Dr. P. Shanmugasundaram, Director, School of Pharmaceutical Sciences, VISTAS as ‘Convener’; Dr. Rajiv Dahiya, Director, School of Pharmacy, Faculty of Medical Sciences, The University of the West Indies, St. Augustine, Trinidad & Tobago as ‘Organizing Chairman‘; Dr. Suresh V. Chennupati, Vice President, APP Ethiopian International Branch from Wollega University, Nekemte, Ethiopia and Prof. M. Himaja from Department of Chemistry, School of Advanced Sciences, VIT University, Vellore as ‘Guests of Honor’; Prof. Terezinha De Jesus Andreoli Pinto, Director, School of Pharmaceutical Sciences, University of Sao Paulo, Sao Paulo, Brazil as ‘Scientific Committee Chairman’ and Dr. Kamal Dua from Discipline of Pharmacy, University of Technology Sydney, Sydney, New South Wales, Australia as ‘Scientific Committee Co-Chairman’. 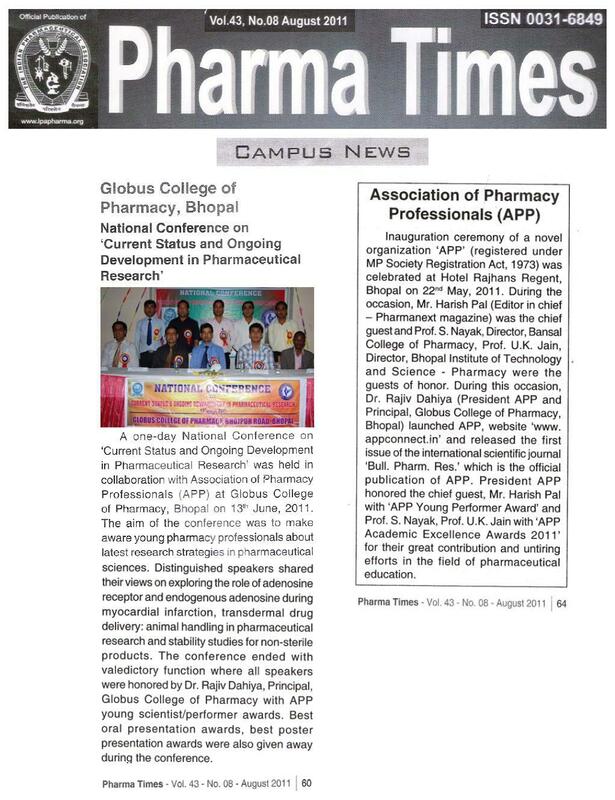 Scientific session of the convention was enriched with lectures of Dr. Sunita Dahiya, General Secretary APP from Department of Pharmaceutical Sciences, School of Pharmacy, University of Puerto Rico, San Juan, PR, USA; Dr. Sachin Dubey, International Head, APP IP-DRA Division and Head, Formulation Development (Biologics), Glenmark Pharmaceuticals S.A., Switzerland and Prof. Kuntal Das, President, APP Karnataka State Branch from Department of Phytochemistry and Pharmacognosy, Krupanidhi College of Pharmacy, Chikkabellandur, Bangalore, Karnataka on different topics of pharmaceutical interest like ‘Moving a drug from BCS class II to BCS class I: A case study of limited water soluble drug’, ‘Developing a robust analytical package for demonstrating biosimilarity’ and ‘Health with nutraceuticals: A current challenge in pharmaceuticals’. 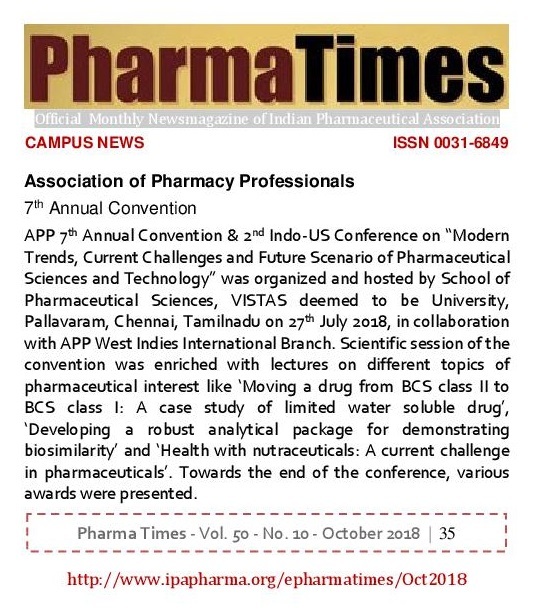 The vote of thanks was given by Dr. M. Vijey Aanandhi, Co-convener & Head, Department of Pharmaceutical Chemistry & Analysis, School of Pharmaceutical Sciences, VISTAS. 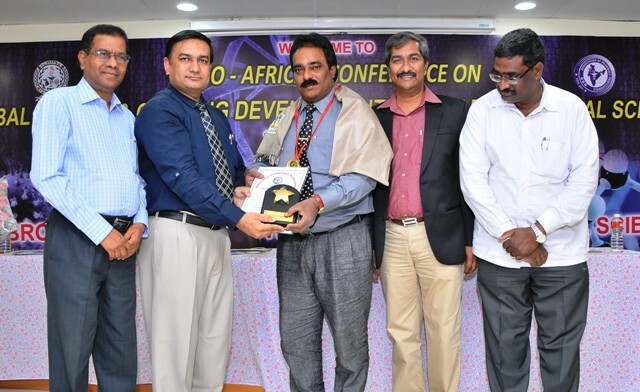 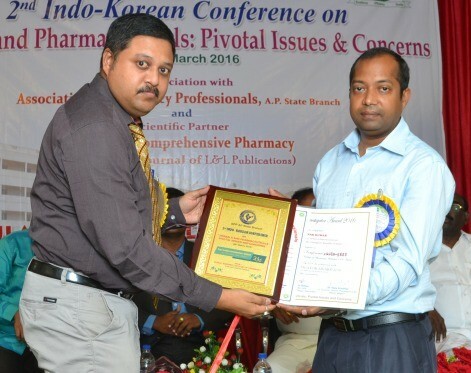 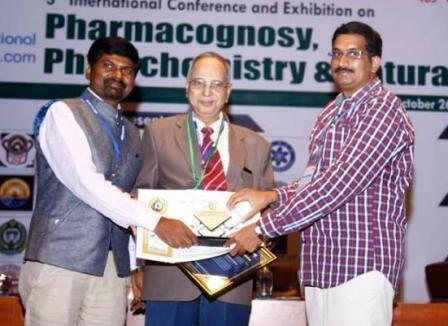 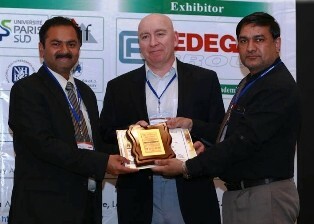 At the end of the conference, Dr. P. Shanmugasundaram, Director, School of Pharmaceutical Sciences, VISTAS was felicitated with ‘APP Principal of the Year Award’; Dr. Sachin Dubey, Head, Formulation Development (Biologics), Glenmark Pharmaceuticals S.A., Switzerland with ‘APP Young Achiever Award’; Dr. Palanisamy Selvamani, Assistant Professor, Department of Pharmaceutical Technology, Anna University, BITS Campus, Tiruchirappalli, Tamilnadu with ‘APP Fellow Membership Award’; Dr. Natarajan Jawahar, Assistant Professor, Department of Pharmaceutics, JSS College of Pharmacy, Rocklands, Ooty, Tamilnadu with ‘APP Young Talent Award’; Dr. Sunita Dahiya, Assistant Professor, Department of Pharmaceutical Sciences, School of Pharmacy, University of Puerto Rico, San Juan, PR, USA with ‘APP Young Investigator Award’; Dr. S. Latha, Assistant Professor, Department of Pharmaceutical Technology, Anna University, Tiruchirappalli with ‘APP Young Pharmacist Award’; Prof. P. Swaminathan, Vice-Chancellor, VISTAS with ‘APP Appreciation Award’ and Dr. D. Praveen, Research Scholar, School of Pharmaceutical Sciences, VISTAS, Chennai with ‘APP Overall Excellent Student Performance Award’. 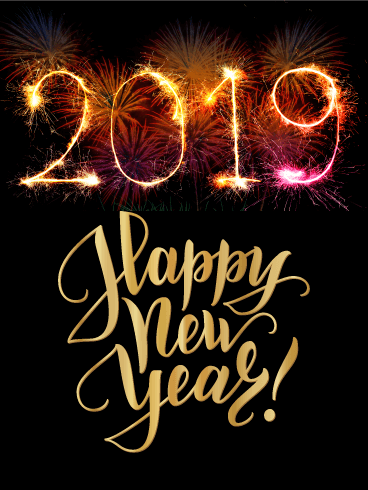 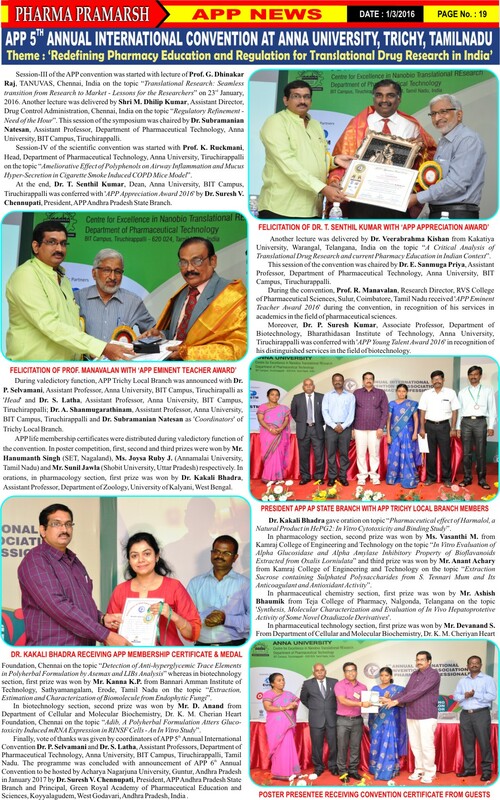 Programme terminated with announcement of APP Tamilnadu State Branch headed by Dr. P. Shanmugasundaram, APP Brazilian International Branch headed by Prof. Terezinha De Jesus Andreoli Pinto and APP Malaysian International Branch headed by Dr. K. Jaya Raja Kumar, AIMST University, Malaysia. 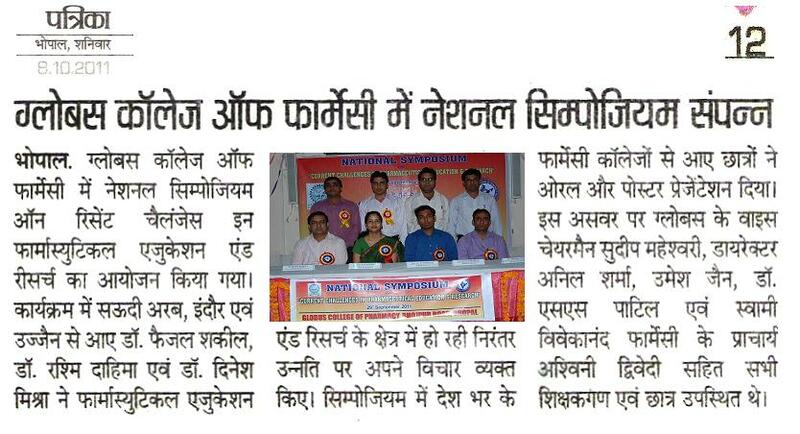 On the occasion of International Youth Day, 6th Annual Convention of Association of Pharmacy Professionals on ‘Future of Pharmacy and Pharmacists in Profession’ was organized and hosted by APP Rajasthan State Branch at the beautiful campus of Alwar Pharmacy College, Alwar, Rajasthan, India. 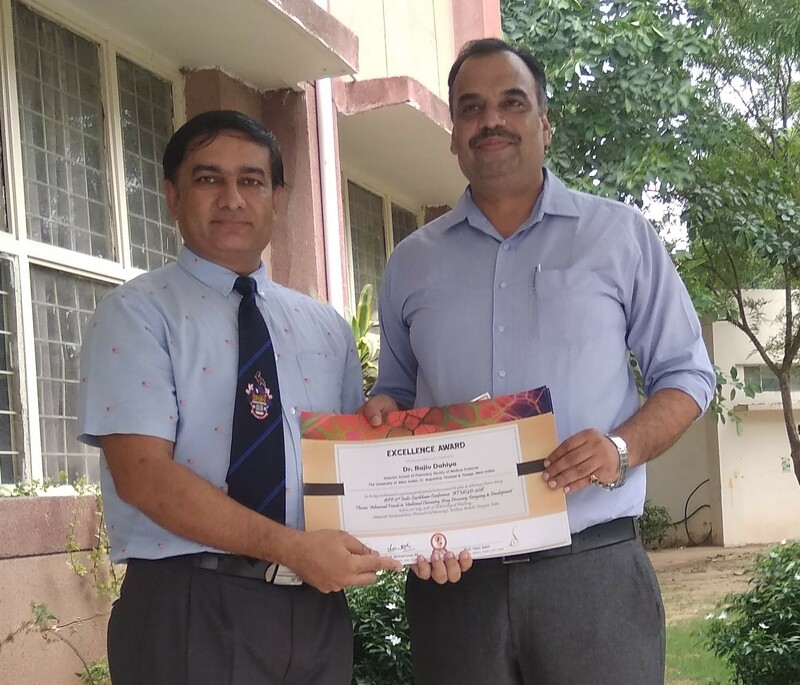 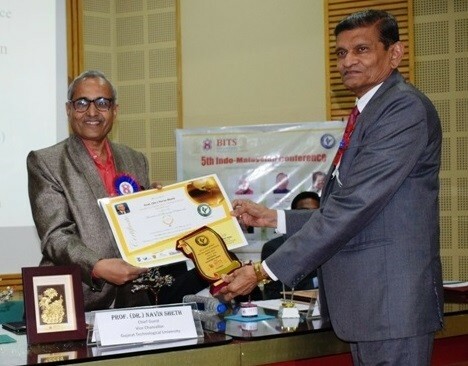 During convention, Dr. Rajesh Kumar Yadav, Assistant Registrar (Exam Secrecy), Rajasthan University of Health Sciences, Jaipur, Rajasthan acted as ‘Chief Guest’; Dr. V. K. Agarwal, Chancellor, SunRise University, Alwar and Chairman, IET Group, Alwar acted as ‘Chief Patron’; Dr. Manju Agarwal, Executive Director, IET Group, Alwar acted as ‘Patron’; Dr. Rajiv Dahiya, President APP and Director, School of Pharmacy, Faculty of Medical Sciences, The University of the West Indies, St. Augustine, Trinidad & Tobago acted as ‘Convener’ in absentia; Dr. Hemendra Gautam, Vice President APP and Director, Radha Govind Institute of Pharmacy, Chanduasi, Moradabad, Uttar Pradesh acted as ‘Co-convener’; Prof. Govindasamy Jeyabalan, Principal, Alwar Pharmacy College, Alwar and President, APP Rajasthan State Branch acted as ‘Organizing Chairman‘; Dr. Madan Mohan Gupta, Associate Professor, School of Pharmacy, Faculty of Medical Sciences, The University of the West Indies, St Augustine, Trinidad & Tobagoacted as ‘Special Guest from International Community’; Dr. R. S. Parihar, Registrar, SunRise University, Alwar and Dr. B. Narsimhan, Dean, Faculty of Pharmaceutical Sciences, M.D. 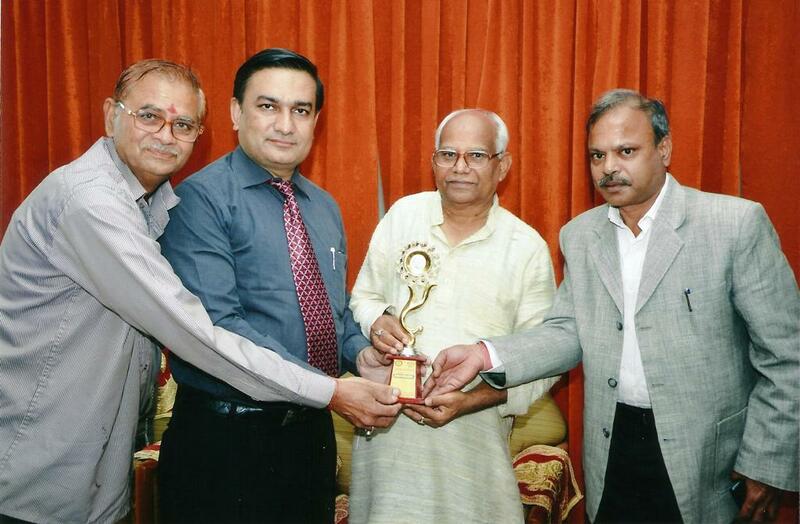 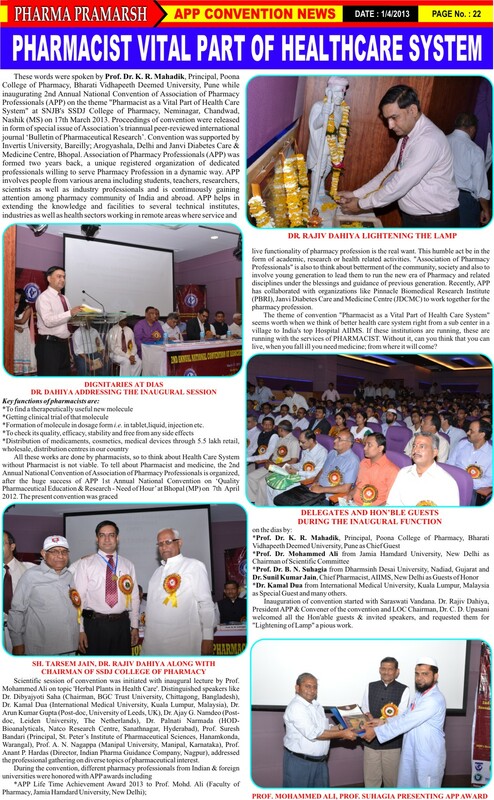 University, Rohtak, Haryana acted as ‘Guest of Honor’; Dr. Sachin Dubey, Head, Formulation Development (Biologics), Glenmark Pharmaceuticals SA, Switzerland and International Head, APP IP-DRA Division acted as ‘Scientific Committee Chairman’; Dr. Sunita Dahiya, General Secretary APP and Professor Adjunct, School of Pharmacy, Pharmaceutical Sciences Department, University of Puerto Rico, San Juan, PR, United States and Dr. Kamal Dua, International Head, APP PharmTech Division from Discipline of Pharmacy, Graduate School of Health,University of Technology Sydney, New South Wales, Australia acted as ‘Scientific Committee Co-chairmans’. 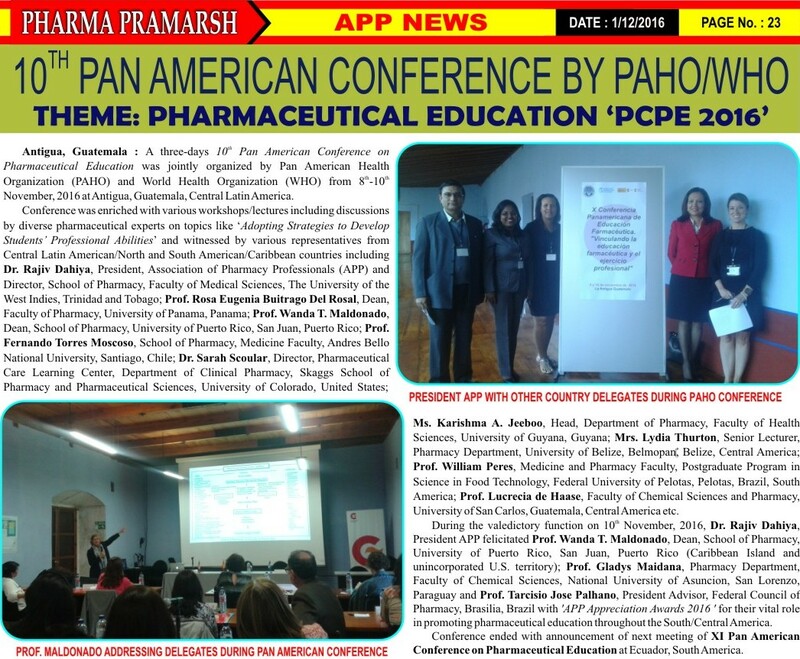 Scientific session of the conference was enriched with lectures of Dr. Madan Mohan Gupta from School of Pharmacy, The University of the West Indies, Trinidad & Tobago on ‘Problem Based Learning: An Effective Method of Teaching and Learning in Pharmaceutical Education’; Dr. Rita Mourya, Joint Secretary, APP Ethiopian International Branch from School of Pharmacy, College of Medicine and Health Sciences, University of Gondar, Gondar, Ethiopia on ‘Diabetes Management: Contemporary Trends and Approaches’ and Dr. Balasubramanian Narasimhan, Dean and Professor, Faculty of Pharmaceutical Sciences, Maharshi Dayanand University, Rohtak, Haryana on ‘Current and Future Role of Modern Pharmacist in Global Scenario’ followed by invited oration by Dr. Gaurav Gupta, Associate Professor, Department of Pharmacology, School of Pharmaceutical Sciences, Jaipur National University, Jaipur, Rajasthan on ‘Nephrotoxicity in Rats exposed to Paracetamol: Protective Role of Moralbosteroid, A Steroidal Glycoside’. 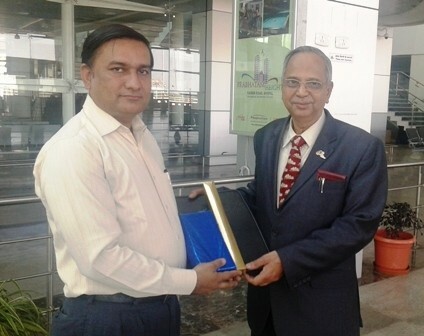 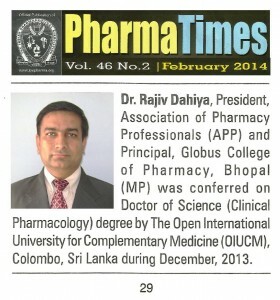 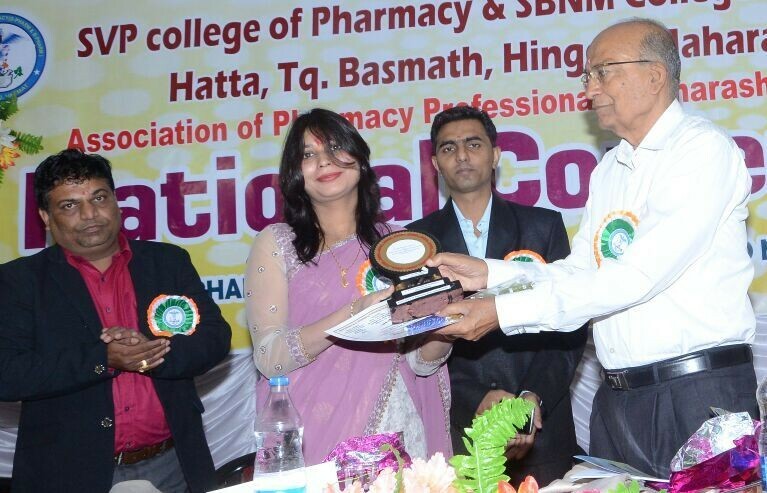 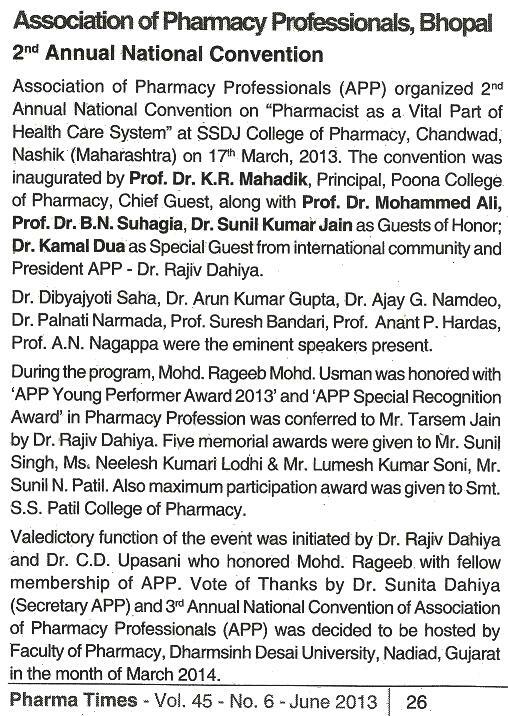 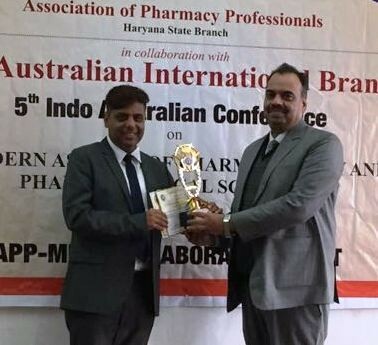 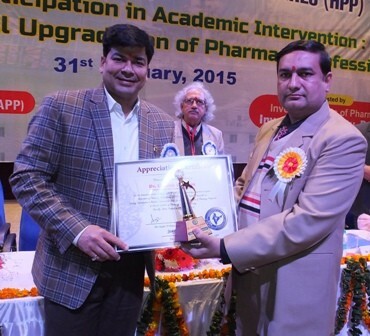 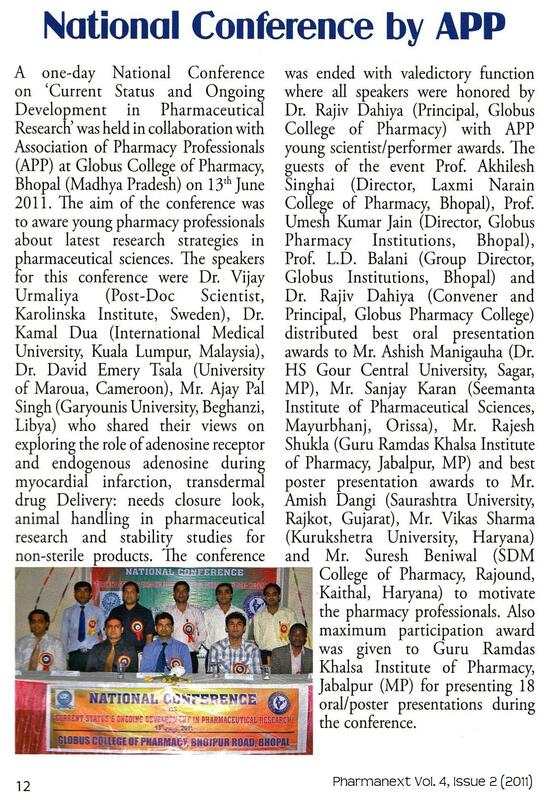 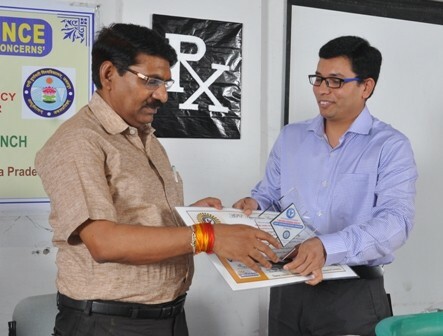 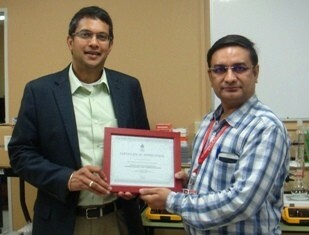 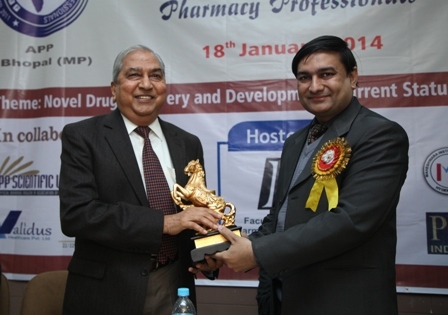 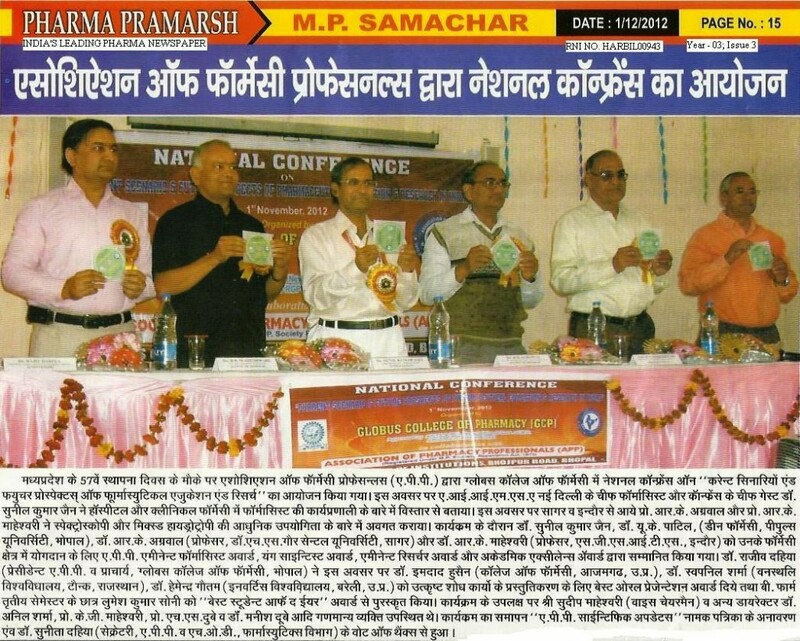 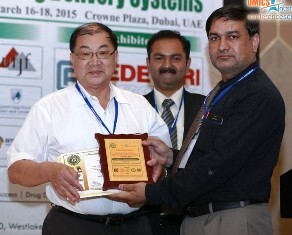 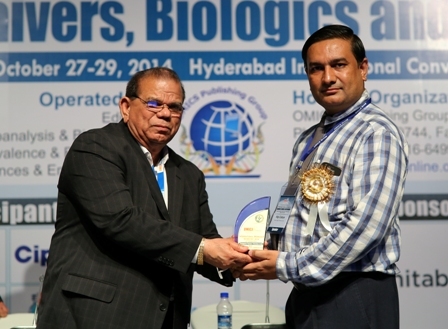 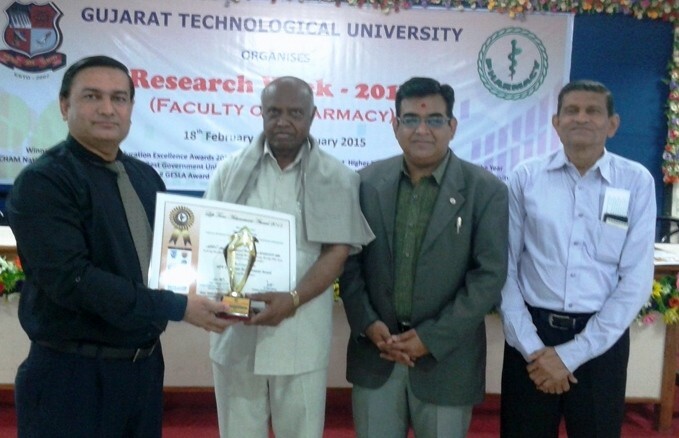 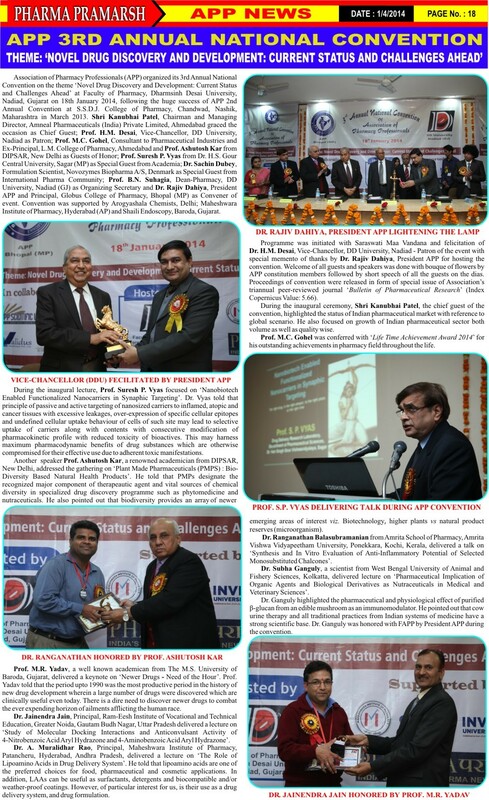 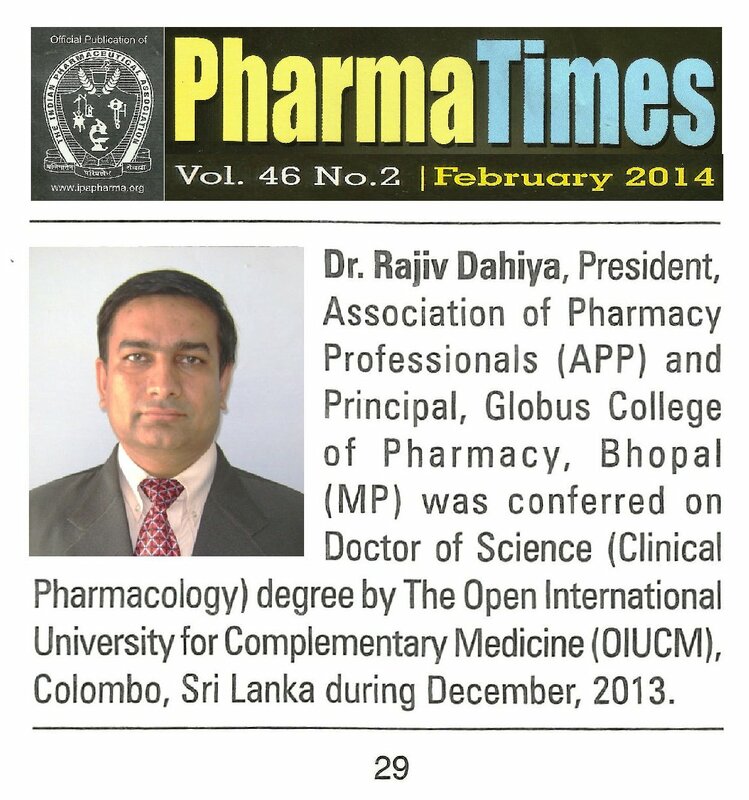 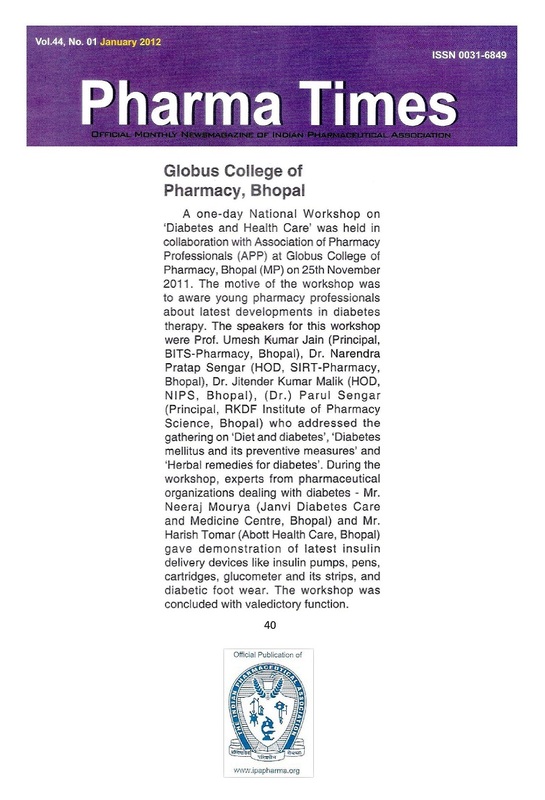 The convention was witnessed by Prof. Saurabh Dahiya, Head, School of Pharmacy, Lingaya’s University, Faridabad, Haryana; Sh. 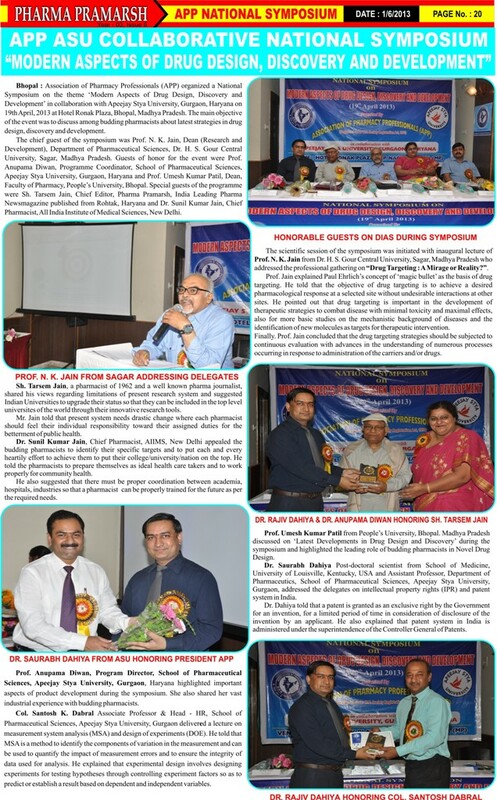 Tarsem Jain, Editor-in-Chief, Pharma Pramarsh, Rohtak, Haryana; Dr. Kalpesh Gaur, Secretary, APP Rajasthan State Branch from Geetanjali University, Udaipur; Dr. Saurabh Kumar Banerjee, Executive Member, APP Rajasthan State Branch from IIHMR University, Jaipur; Mr. Ajit Kumar Yadav, Executive Member, APP from Invertis University, Bareilly, Uttar Pradesh; Mr. Sunil Singh, Executive Member, APP from RKDF University, Bhopal, Madhya Pradesh; Dr. Rajesh Kumar Asija, Principal, Maharishi Arvind Institute of Pharmacy, Mansarovar, Jaipur; Dr. Karni Singh Shekhawat, Principal, Sri Balaji College of Pharmacy, Jaipur; Dr. Raghvendra Singh Bhadauria, Principal, Shrinathji Institute of Pharmacy, Nathdwara; Dr. Naresh Kumar Khatri, Principal, Shri USB Pharmacy College, Santpur, Abu Road, Sirohi; Dr. Bhupendra Singh Chauhan, Principal, Siddharth Institute of Technology (Pharmacy), Jaipur; Dr. Vinesh Kumar, Principal, Lal Bahadur Shastri College of Pharmacy, Jaipur; Mr. Vivek Kaushik, Principal, Krishnadevi Maheshwari Pharmacy College, Bagar, Jhunjhunu; Mr. P. L. Bhaskar, Principal, Mahatma Gandhi College of Pharmacy, Sikar, Rajasthan etc. 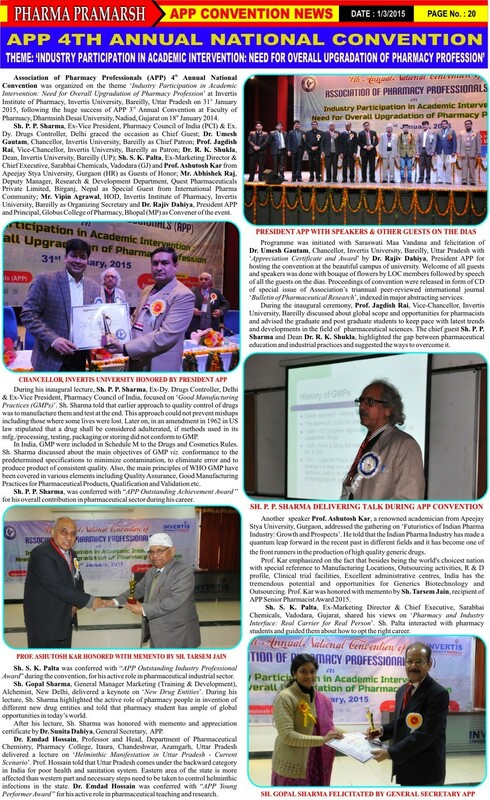 During convention, as per the decision taken by Central Executive Council (CEC) of the association, Prof. Saurabh Dahiya (Lingaya’s University, Faridabad) nominated as President, APP Haryana State Branch; Prof. Balasubramanian Narsimhan (Maharshi Dayanand University, Rohtak) nominated as Secretary, APP Haryana State Branch; Prof. Raghvendra Singh Bhadauria (Shrinathji Institute of Pharmacy, Nathdwara) nominated as President, APP Rajasthan State Branch; Dr. Gaurav Gupta (Jaipur National University, Jaipur) nominated as National Head, APP MolPharm Division; Dr. Kavita Pabreja (The University of Newcastle, NSW, Australia)nominated as International Coordinator, APP MolPharm Division; Dr. Kamal Dua (University of Technology Sydney, Australia)nominated as International Head, APP PharmTech Division w.e.f. 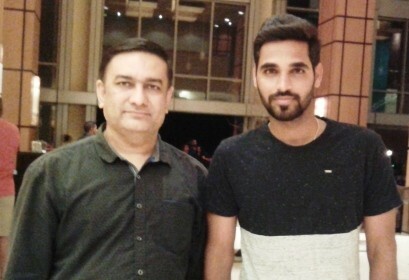 2017-18. 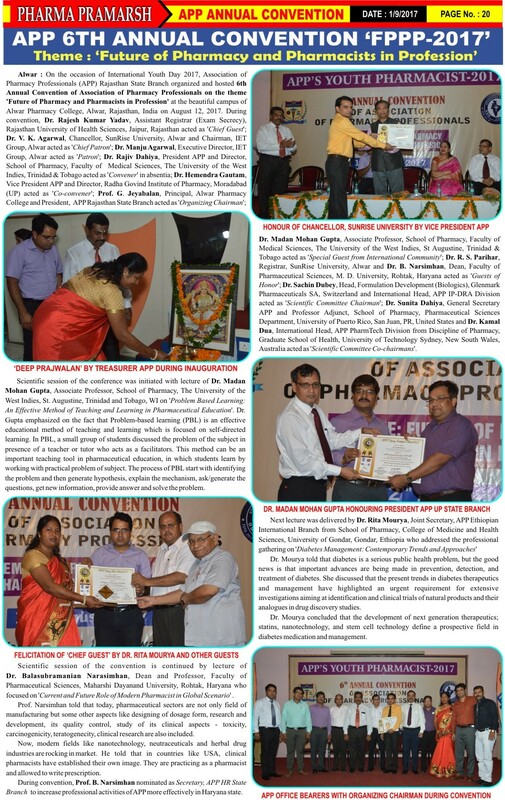 Valedictory function of the convention was initiated with announcement of the title ‘Father of Pharmacy Practice Education in India’ to Prof. B. Suresh, Vice Chancellor, JSS University, Mysore, Karnataka and President, Pharmacy Council of India. 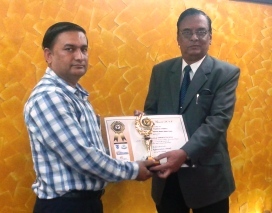 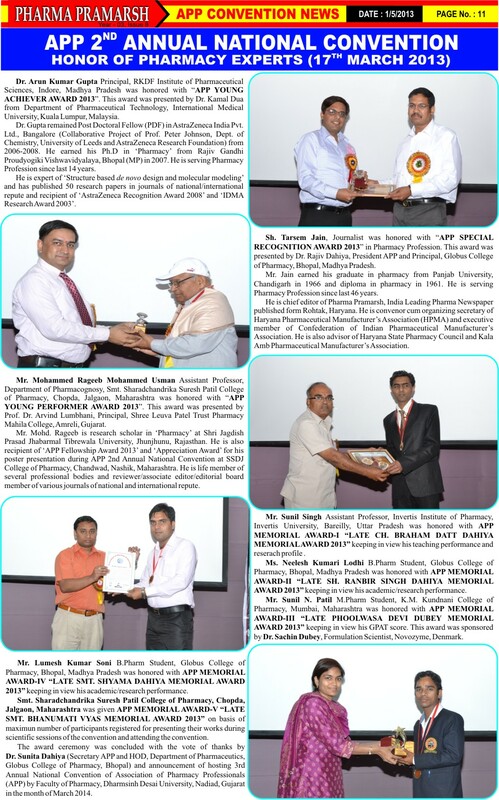 This was followed by distribution of APP appreciation awards to the Chief Patron, Patron and Organizing Chairman; certificates of appreciation to the speakers of convention; outstanding oration award (Late Mr. Manas Tripathi Memorial Award) to Dr. Gaurav Gupta; best oration prizes to Mr. Vikas Sharma (Chandigarh University, Mohali, Punjab), Mr. Suresh Kumar (Kurukshetra University, Haryana), Mr. Ajit Yadav (Invertis University, Bareilly, Uttar Pradesh), Mr. Sunil Singh (RKDF University, Bhopal, Madhya Pradesh); best research paper award in ‘Drug Design and MedChem Section’ to Dr. Vipin Kumar, Dean and Professor, Department of Pharmacy, School of Chemical Sciences and Pharmacy, Central University of Rajasthan, Ajmer; best poster awards to students from diverse pharmacy institutions; APP profile awards to diverse pharmacy professionals viz. 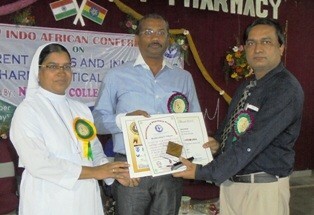 Outstanding Achievement Award to Sh. 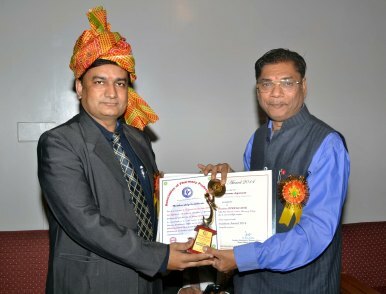 Ajay Phatak, Drug Controller of Rajasthan; Young Talent Award to Dr. Rajesh Kumar Yadav, Assistant Registrar (Exam Secrecy), Rajasthan University of Health Sciences; Young Investigator Award to Prof. Jainendra Jain, Principal, RamEesh Institute of Vocational and Technical Education, Greater Noida and Young Achiever Award to Dr. Md Zaheen Hassan Ansari, Associate Professor, Alwar Pharmacy College from Rajasthan and surrounding states. 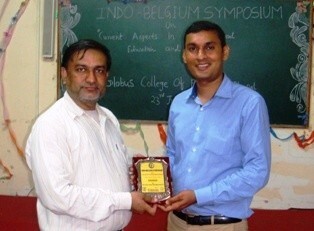 Also, best student award (Late Smt. 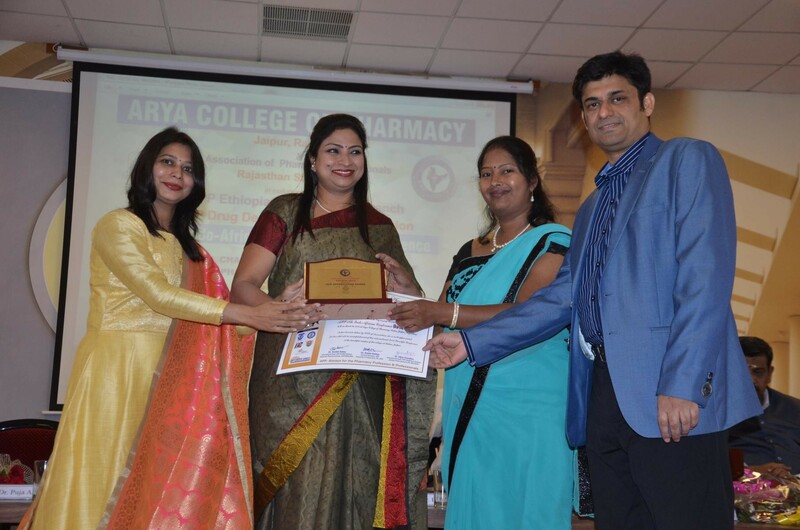 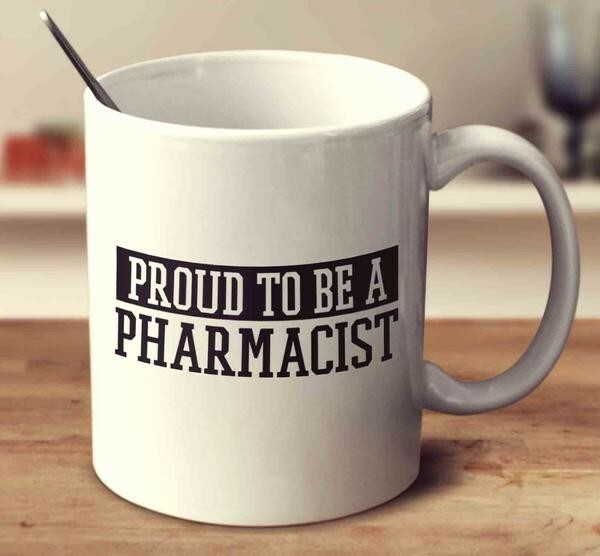 Phoolwasa Devi Dubey Memorial Award) was provided to Ms. Ankita Pandey, B. Pharm IV Year student, Alwar Pharmacy College, Alwar, Rajasthan for her excellent academic record. 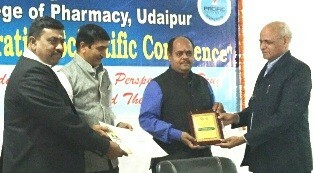 The convention ended with vote of thanks by Dr. Narendra Nyola, Joint Secretary, APP Rajasthan State Branch. 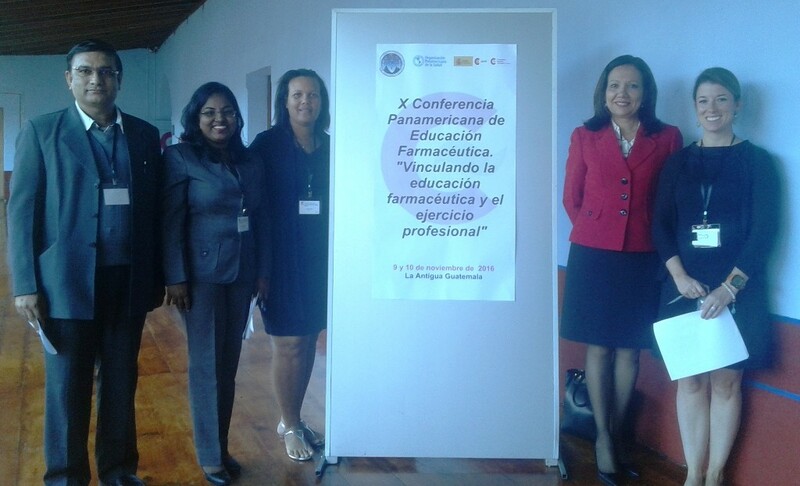 A three-days 10th Pan American Conference on ‘Pharmaceutical Education‘ was jointly organized by Pan American Health Organization (PAHO) and World Health Organization (WHO) from 8th-10th November, 2016 at Antigua, Guatemala, Central Latin America. 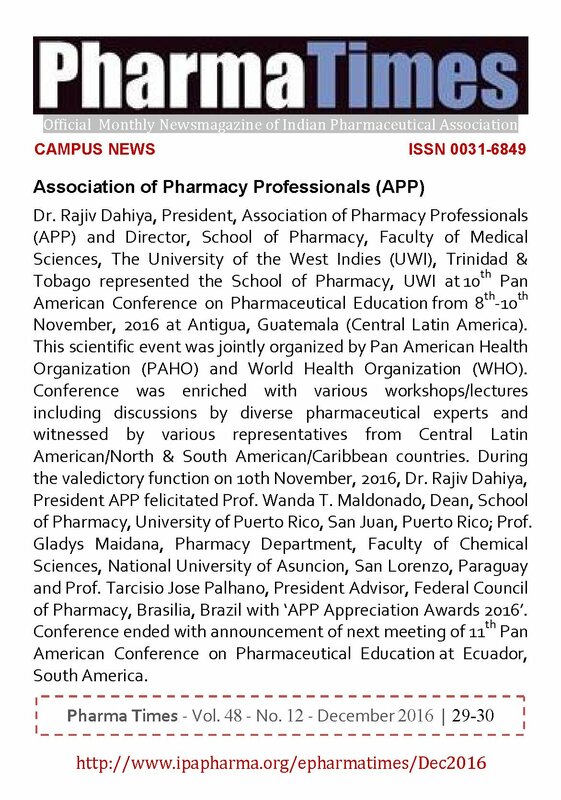 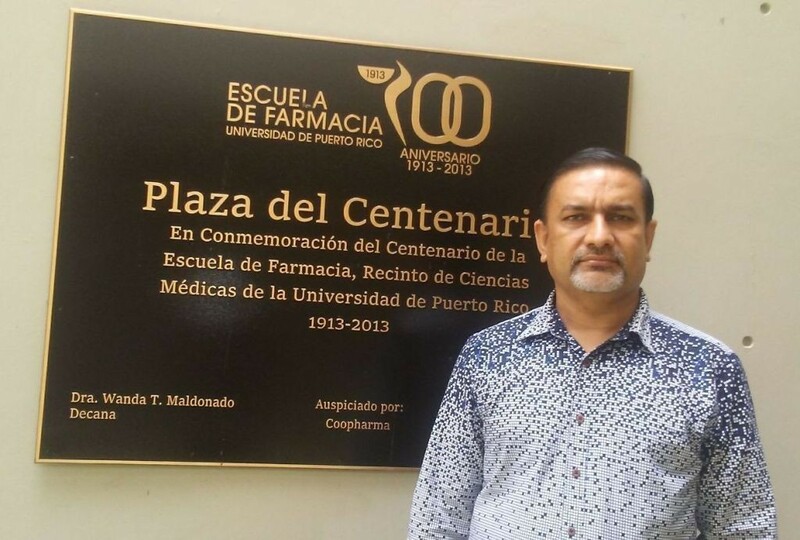 Conference was enriched with various workshops/lectures including discussions by diverse pharmaceutical experts on topics like ‘Adopting Strategies to Develop Students’ Professional Abilities’ and witnessed by various representatives from Central Latin American/North and South American/Caribbean countries including Dr. Rajiv Dahiya, President, Association of Pharmacy Professionals (APP) and Director, School of Pharmacy, Faculty of Medical Sciences, The University of the West Indies, Trinidad and Tobago; Prof. Rosa Eugenia Buitrago Del Rosal, Dean, Faculty of Pharmacy, University of Panama, Panama; Prof. Wanda T. Maldonado, Dean, School of Pharmacy, University of Puerto Rico, San Juan, Puerto Rico; Prof. Fernando Torres Moscoso, School of Pharmacy, Medicine Faculty, Andres Bello National University, Santiago, Chile; Dr. Sarah Scoular, Director, Pharmaceutical Care Learning Center, Department of Clinical Pharmacy, Skaggs School of Pharmacy and Pharmaceutical Sciences, University of Colorado, United States; Ms. Karishma A. Jeeboo, Head, Department of Pharmacy, Faculty of Health Sciences, University of Guyana, Guyana; Mrs. Lydia Thurton, Senior Lecturer, Pharmacy Department, University of Belize, Belmopan‎, Belize, Central America; Prof. William Peres, Medicine and Pharmacy Faculty, Postgraduate Program in Science in Food Technology, Federal University of Pelotas, Pelotas, Brazil, South America; Prof. Lucrecia de Haase, Faculty of Chemical Sciences and Pharmacy, University of San Carlos, Guatemala, Central America etc. 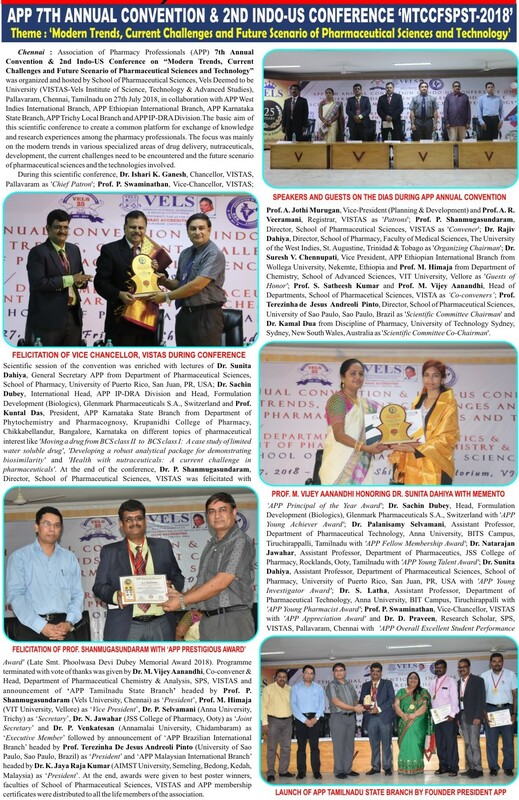 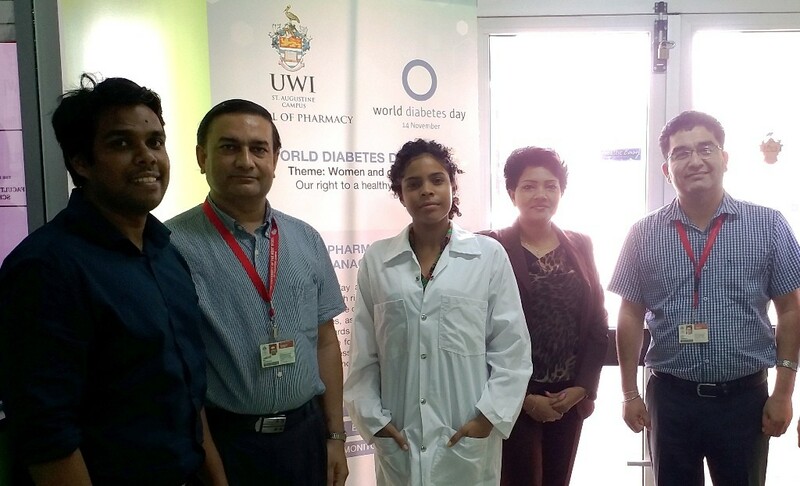 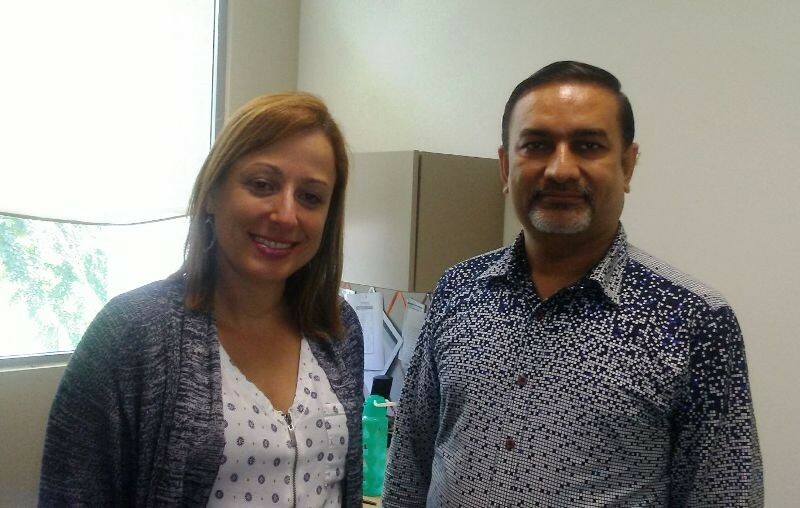 During the valedictory function on 10th November, 2016, Dr. Rajiv Dahiya, President APP felicitated Prof. Wanda T. Maldonado, Dean, School of Pharmacy, University of Puerto Rico, San Juan, Puerto Rico (Caribbean Island and unincorporated U.S. territory); Prof. Gladys Maidana, Pharmacy Department, Faculty of Chemical Sciences, National University of Asuncion, San Lorenzo, Paraguay and Prof. Tarcisio Jose Palhano, President Advisor, Federal Council of Pharmacy, Brasilia, Brazil with ‘APP Appreciation Awards 2016‘ for their vital role in promoting pharmaceutical education throughout the South/Central America. 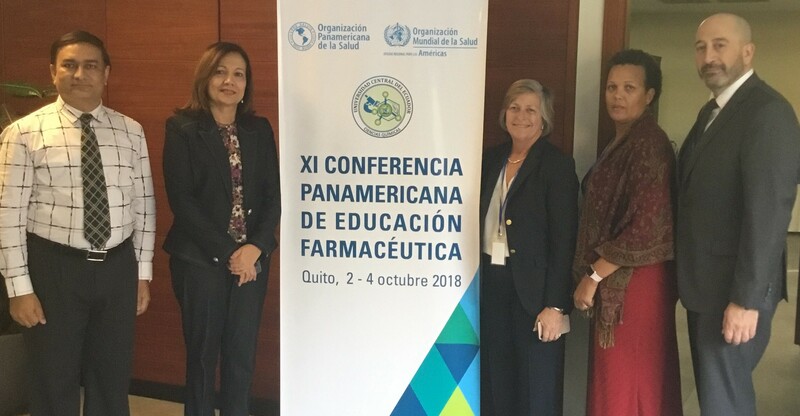 Conference ended with announcement of next meeting of XI Pan American Conference on Pharmaceutical Education at Ecuador, South America. 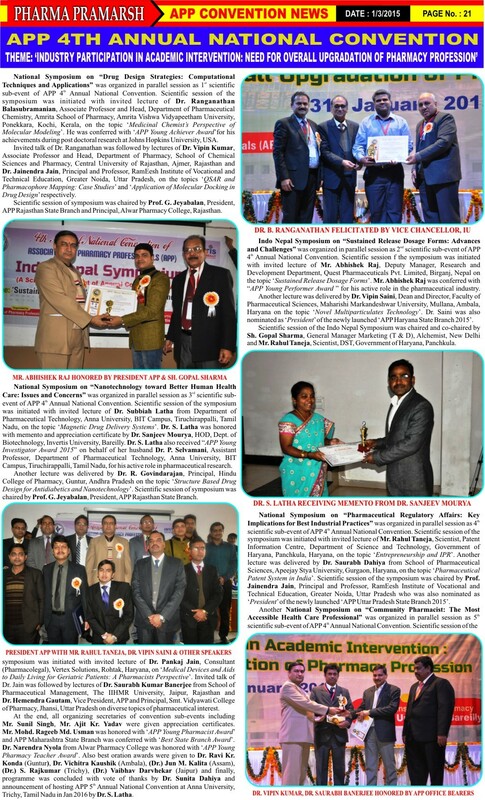 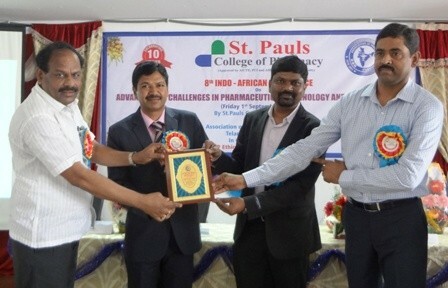 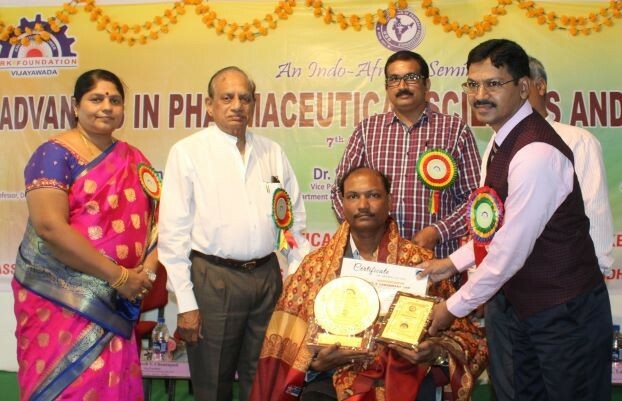 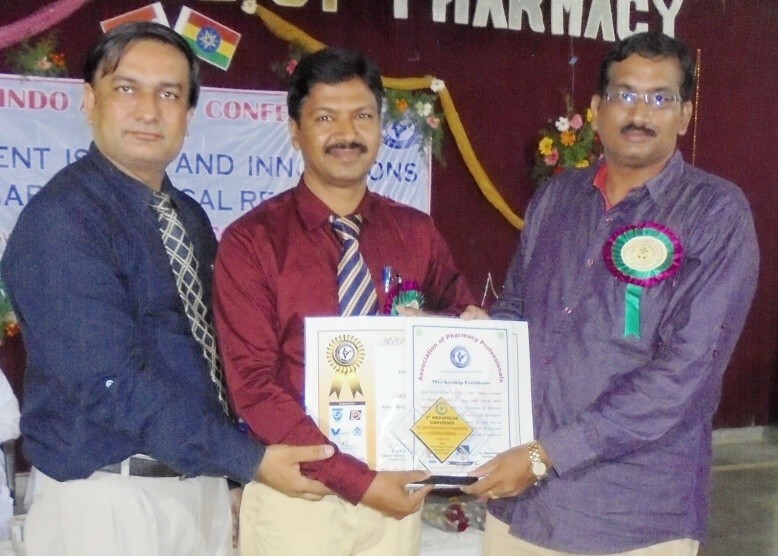 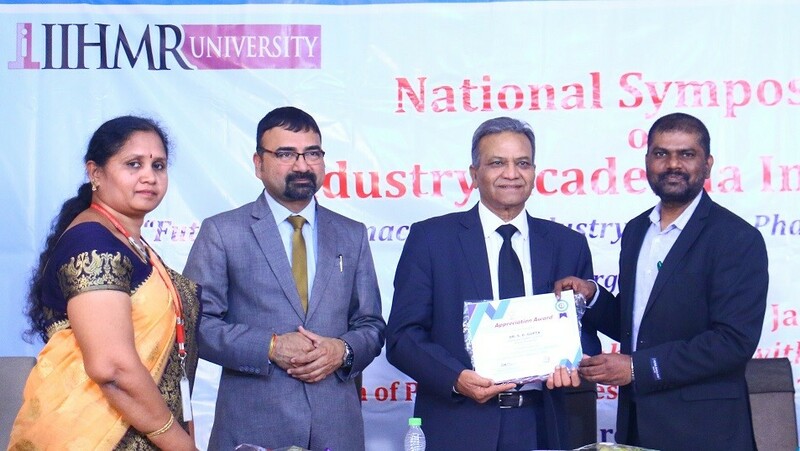 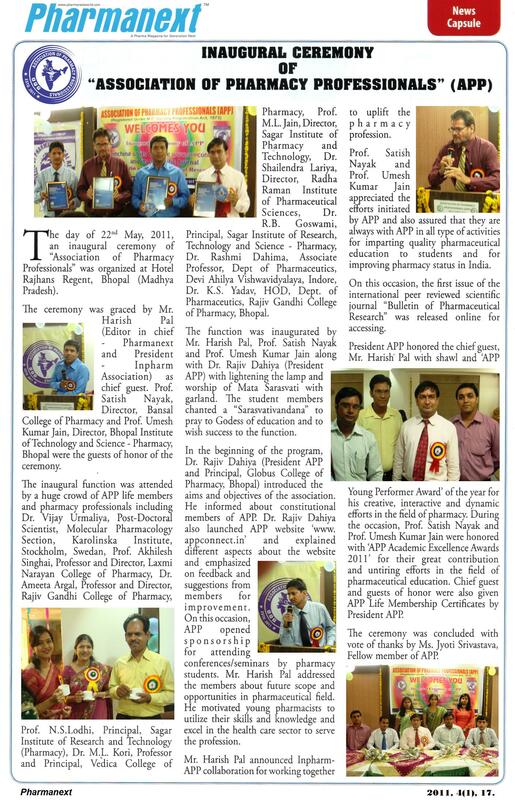 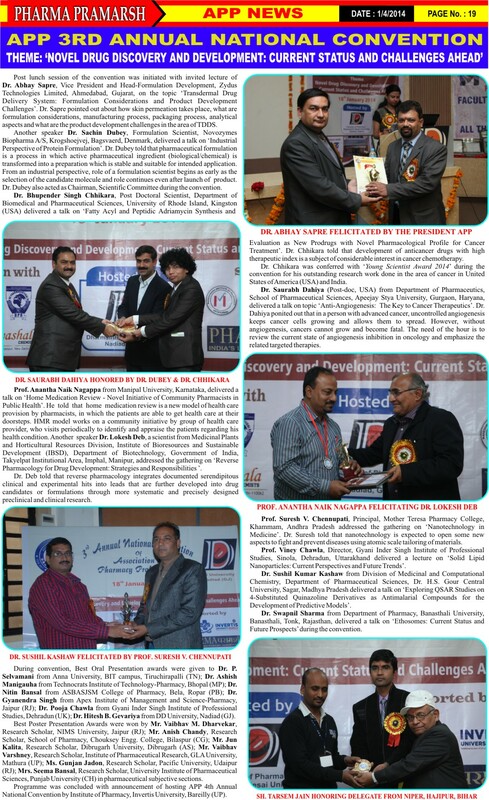 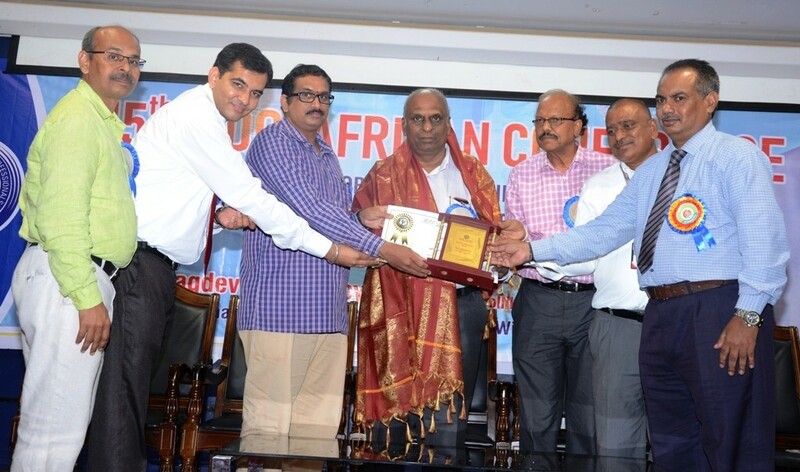 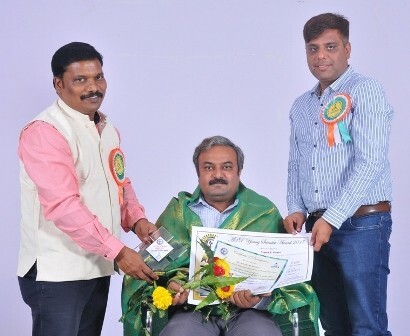 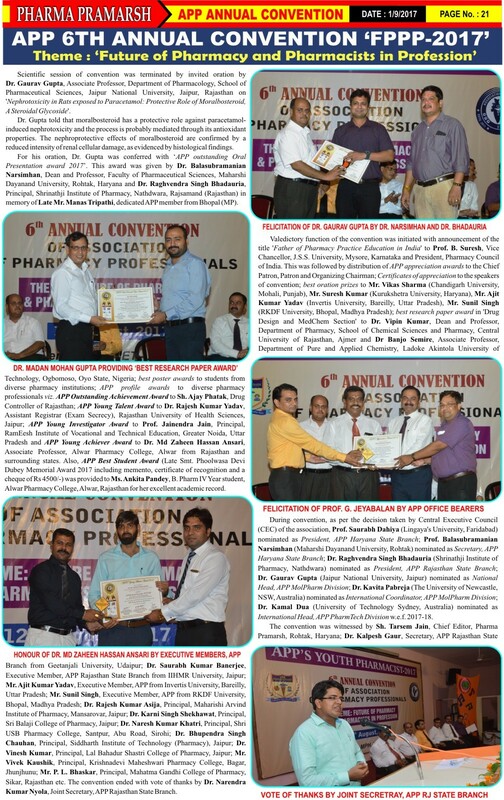 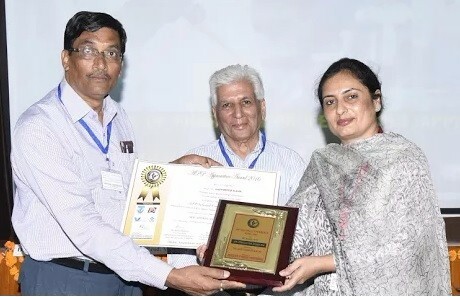 Association of Pharmacy Professionals (APP) 5th Annual International Convention on “Redefining Pharmacy Education and Regulation for Translational Drug Research in India” was organized at Department of Pharmaceutical Technology, Anna University, BIT Campus, Tiruchirappalli and Pinnacle Hall, Breeze Residency, Tiruchirappalli, Tamil Nadu, India on 22nd-23rd January, 2016. 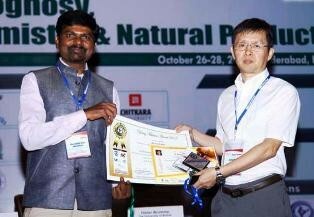 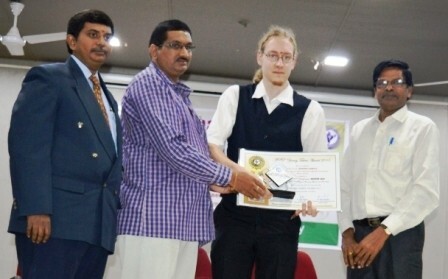 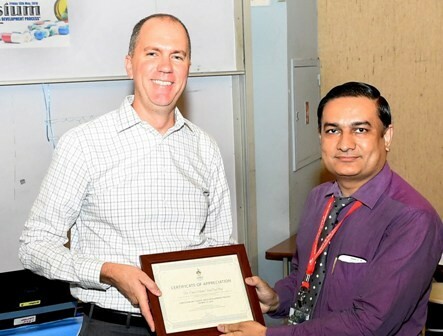 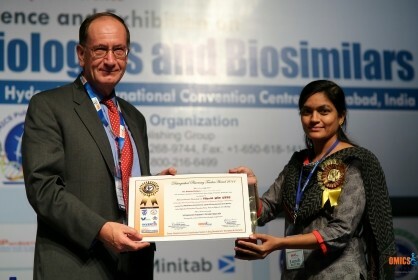 This international event was organized in association with ‘European Society for Translational Medicine’ and ‘Austrian Society for Translational Medicine’ and sponsored by Department of Science & Technology and Department of Biotechnology, Ministry of Science and Technology, New Delhi, India. 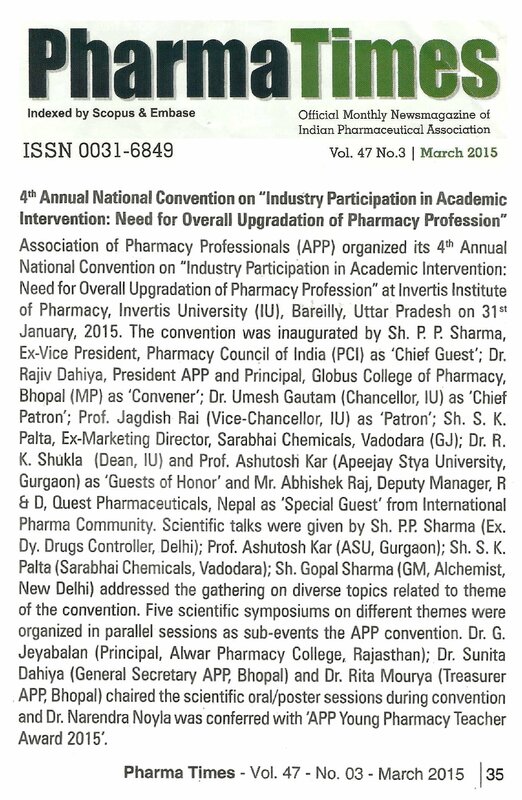 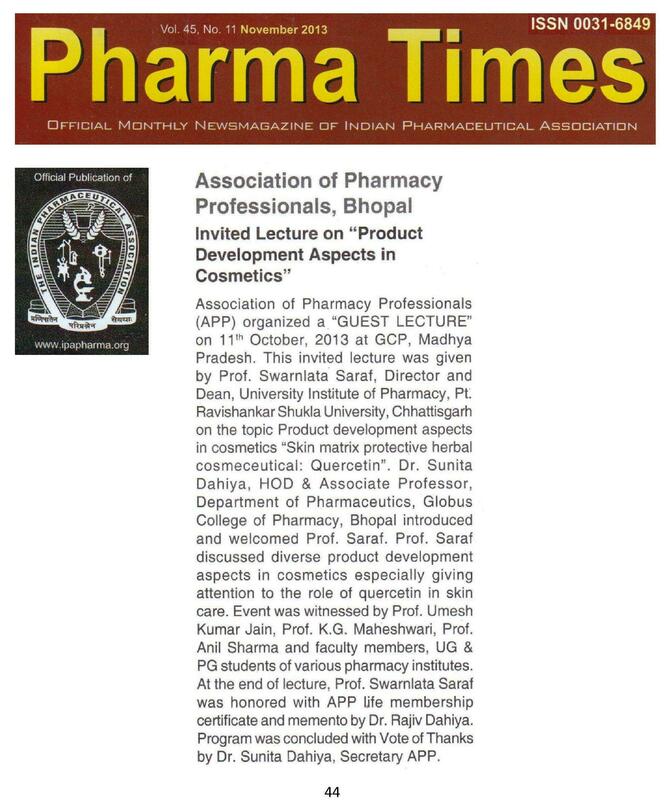 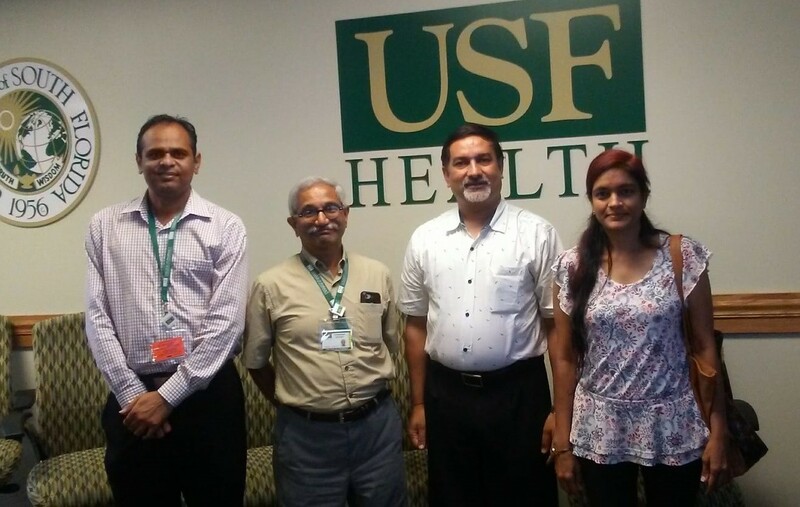 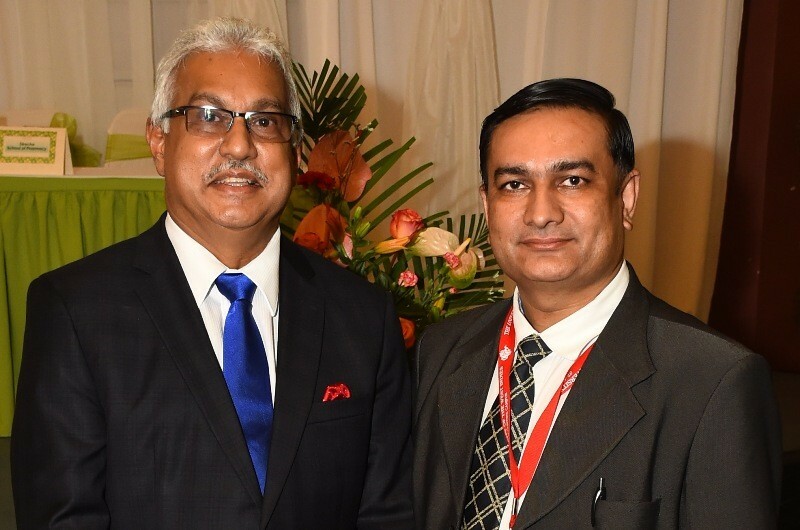 Dr. Rajiv Dahiya and Dr. Sunita Dahiya, President & Secretary of Association of Pharmacy Professionals (APP) convened this international convention in absentia and Dr. P. Selvamani and Dr. S. Latha from hosting university acted as ‘Coordinators’. 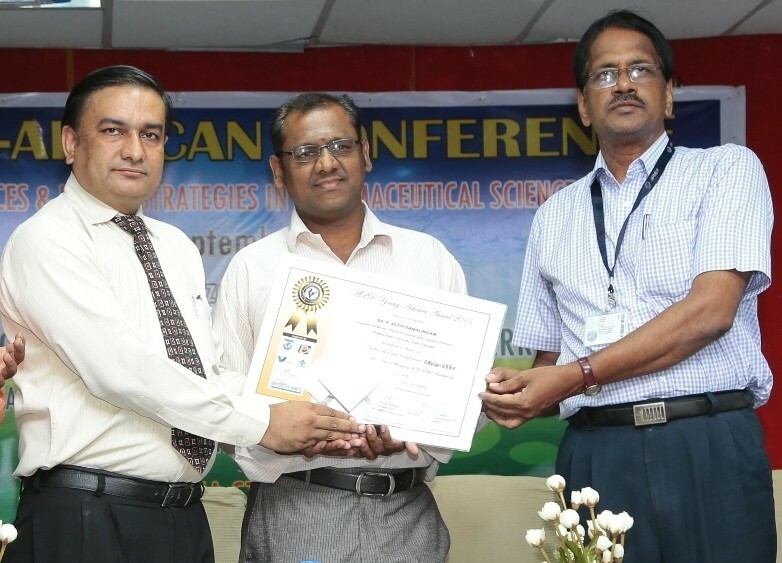 Scientific session of convention was enriched with scientific lecture of Prof. Oommen V. Oommen, Secretary, Society for Translational Cancer Research on the topic “Curcumin: The Indian Gold”. 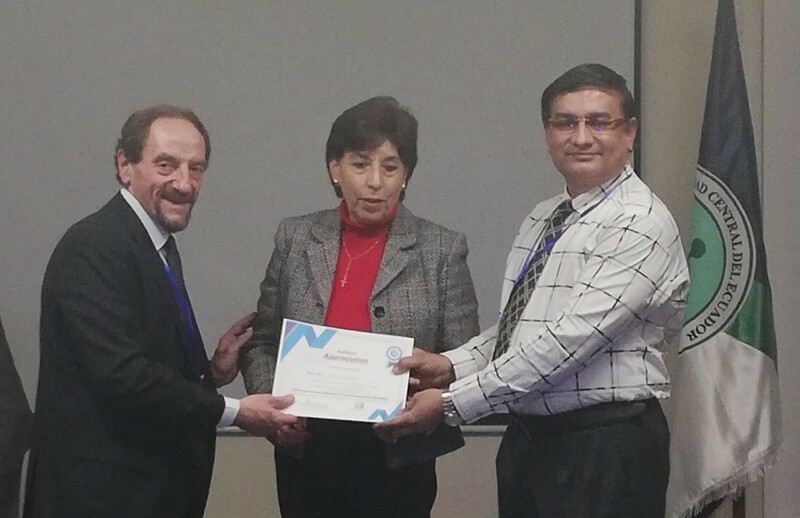 Session-I of the APP international convention was started with lecture of Prof. Ulrich Pfeffer, IRCCS AOU San Martino, IST Istituto Nazionale per la Ricerca sul Cancro, Genova, Italy on the topic “From Genetics to Targeted Prevention of Cancer”. 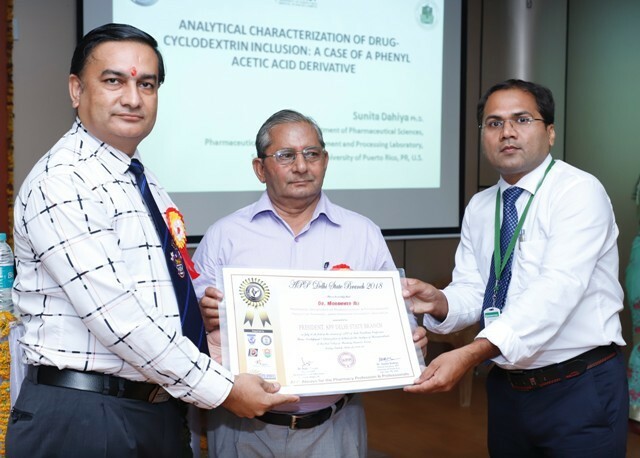 Another lecture was delivered by Dr. S. Rajasekhara Reddy from VIT University, Vellore, Tamil Nadu on topic “Synthesis of Diversity Oriented Bioactive Compounds for Various Therapeutic Applications”. 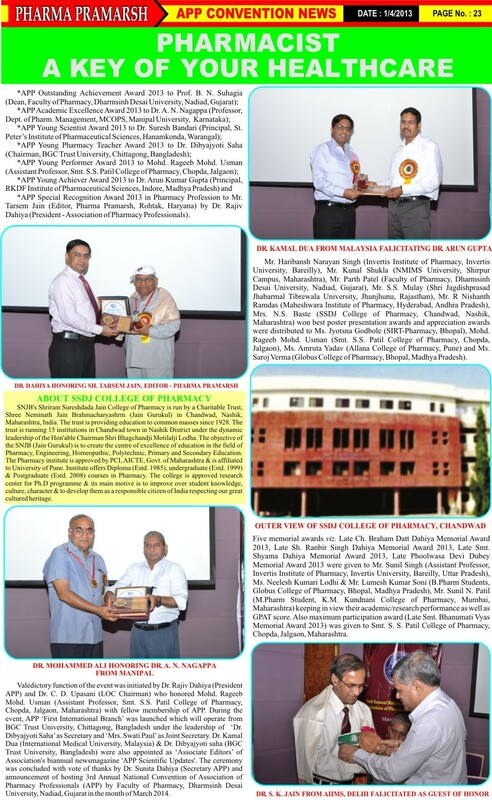 Session-II of the international convention was started with lecture of Prof. S. K. Kulkarni, Former Pro VC, Punjab University, on the topic “Translational Approach in Pharmaceutical Teaching and Training”. 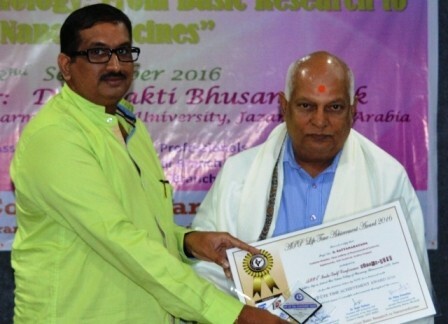 Another lecture was delivered by Dr. G. Mathan from Bharathidasan University, Tiruchirappalli, Tamil Nadu on topic “Molecular Insights into the Anti-cancer Properties of Traditional Tibetan Medicine”. 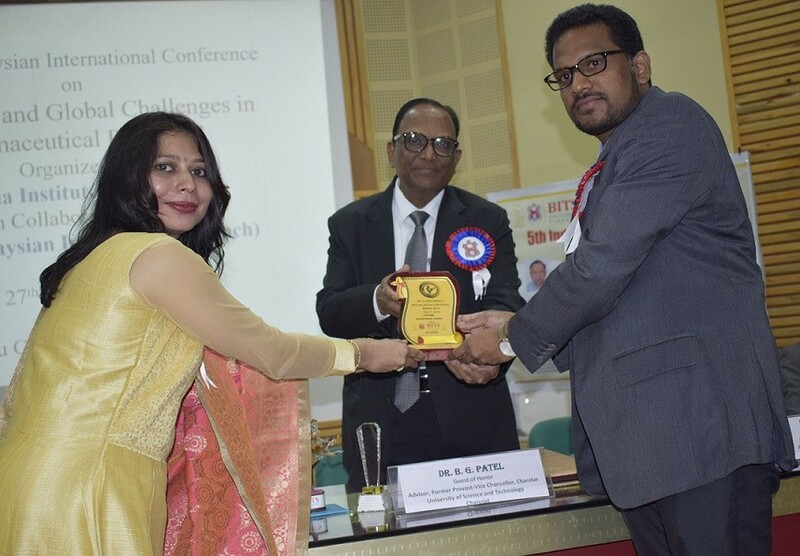 Session-III of the APP convention was started with lecture of Prof. G. Dhinakar Raj, TANUVAS, Chennai, India on the topic “Translational Research: Seamless transition from Research to Market – Lessons for the Researchers”. 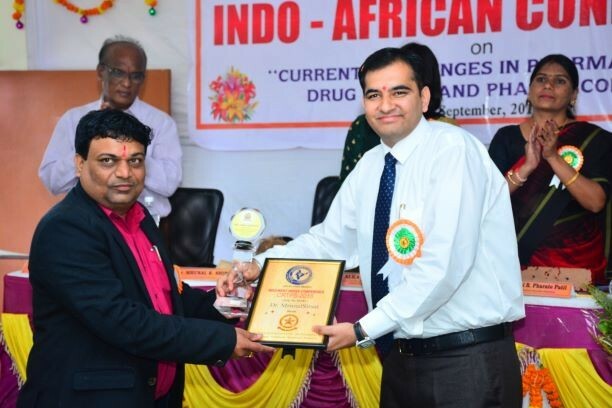 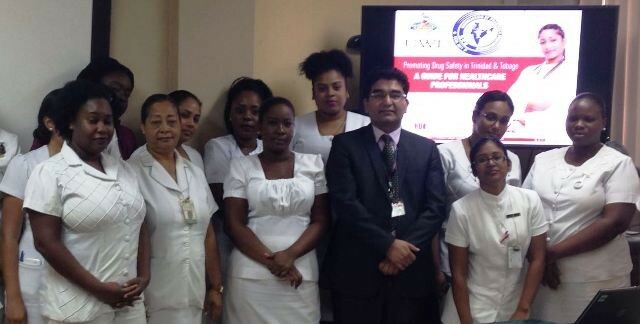 Another lecture was delivered by Shri M. Dhilip Kumar, Assistant Director, Drug Control Administration, Chennai, India on the topic “Regulatory Refinement – Need of the Hour”. 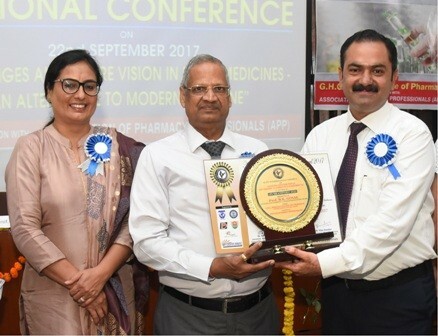 Session-IV of the scientific convention was started with Prof. K. Ruckmani, Head, Department of Pharmaceutical Technology, Anna University, Tiruchirappalli on the topic “Ameliorative Effect of Polyphenols on Airway Inflammation and Mucus Hyper-Secretion in Cigarette Smoke Induced COPD Mice Model”. 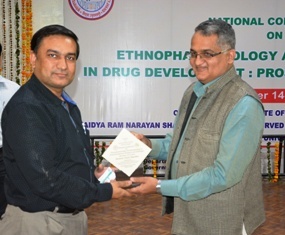 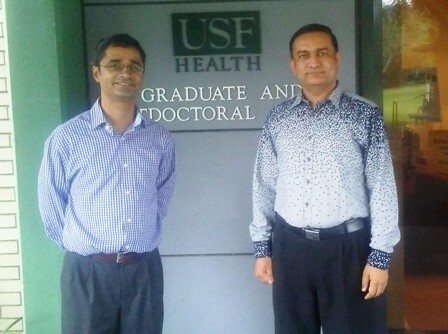 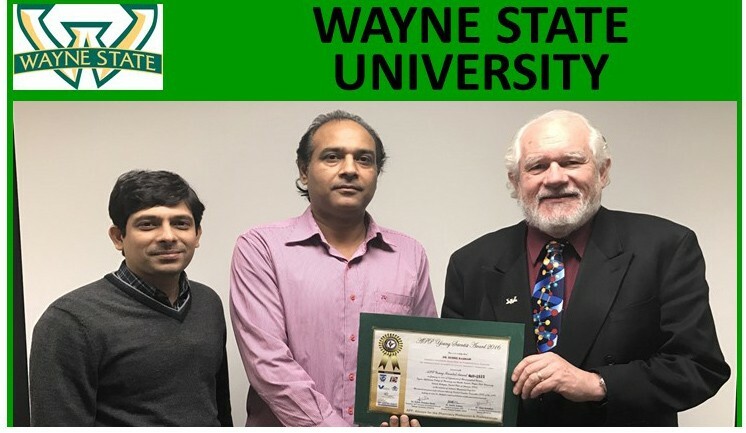 Another lecture was delivered by Dr. Veerabrahma Kishan from Kakatiya University, Warangal, Telangana, India on the topic “A Critical Analysis of Translational Drug Research and current Pharmacy Education in Indian Context”. 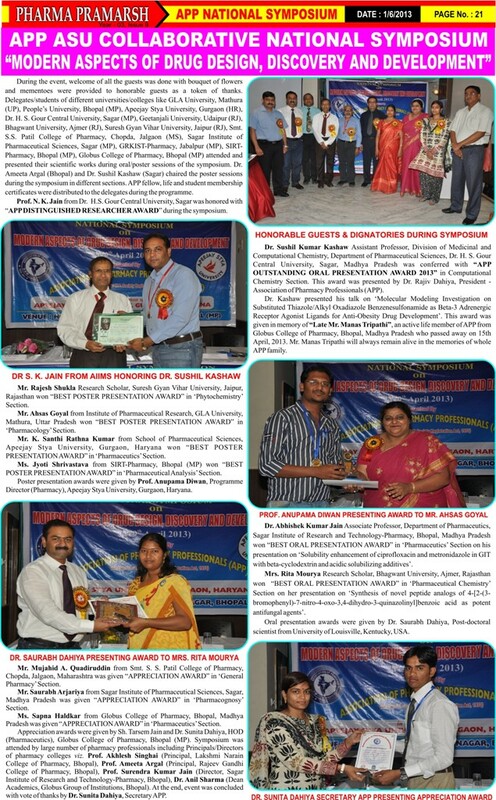 During valedictory function, APP Trichy Local Branch was announced with Dr. P. Selvamani, Assistant Professor, Anna University, BIT Campus, Tiruchirapalli as ‘Head‘ and Dr. S. Latha, Assistant Professor, Anna University, BIT Campus, Tiruchirappalli; Dr. A. Shanmugarathinam, Assistant Professor, Anna University, BIT Campus, Tiruchirappalli and Dr. Subramanian Natesan, Assistant Professor, Anna University, BIT Campus, Tiruchirappalli as ‘Coordinators‘ of Trichy Local Branch. 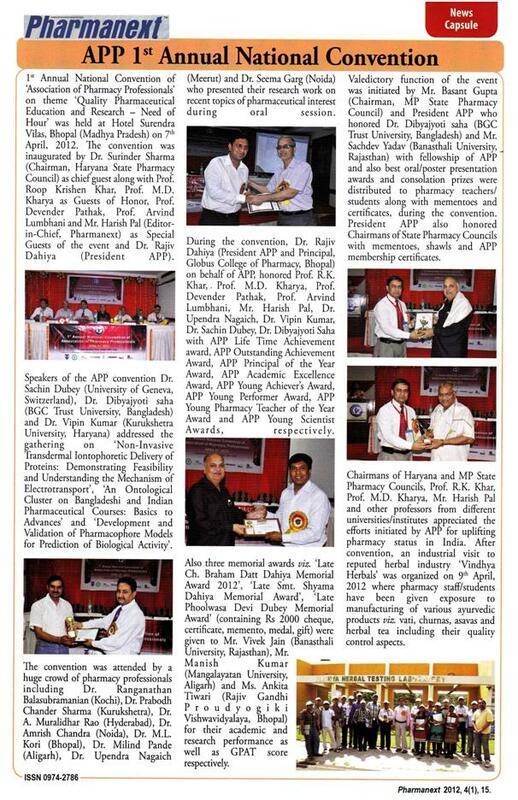 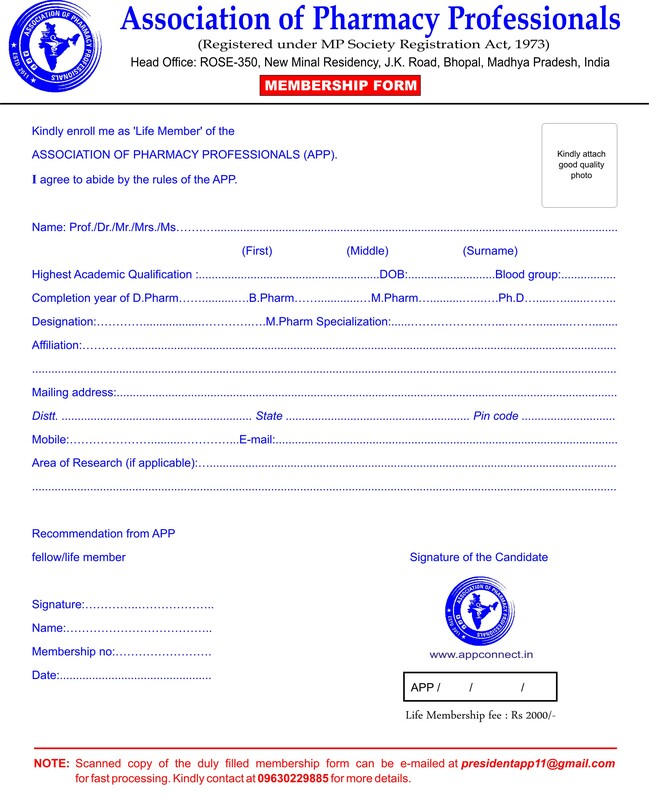 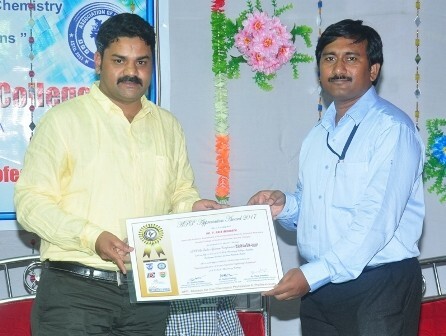 APP life membership certificates were distributed during valedictory function of the convention. 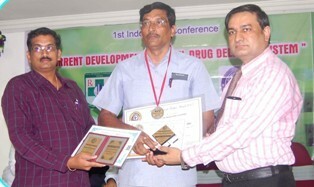 In poster competition, first, second and third prizes were won by Mr. Hanumanth Singh (SET, Nagaland), Ms. Joysa Ruby J. 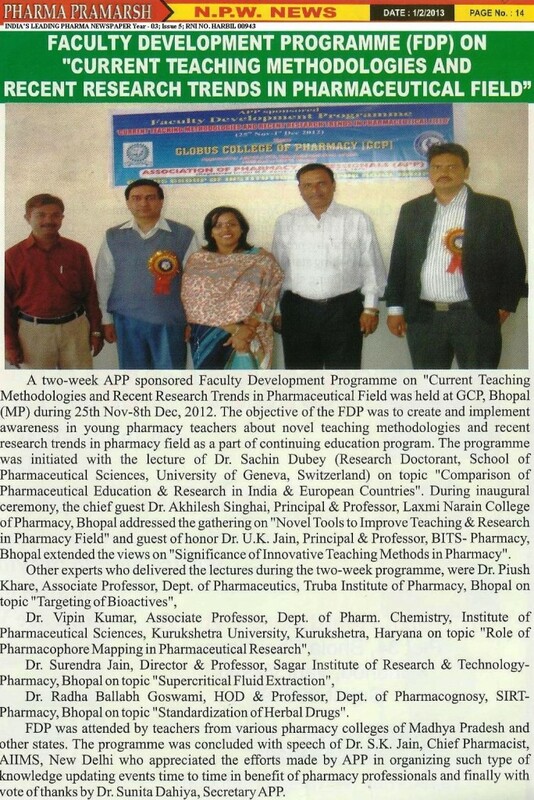 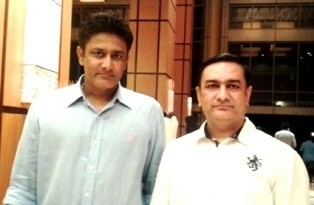 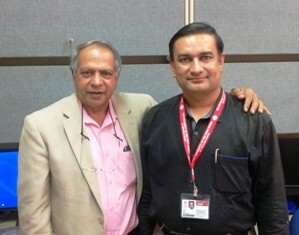 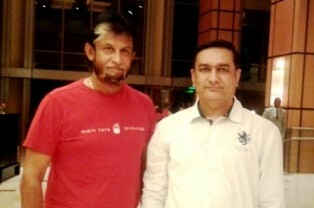 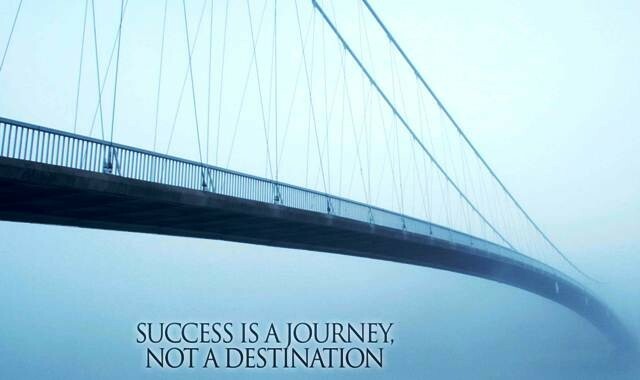 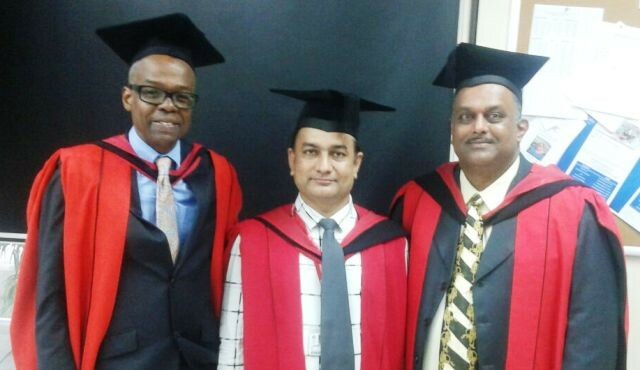 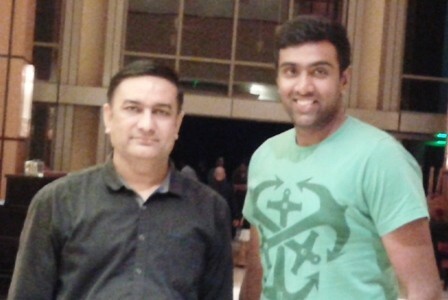 (Annamalai University, Tamil Nadu) and Mr. Sunil Jawla (Shobit University, Uttar Pradesh) respectively. 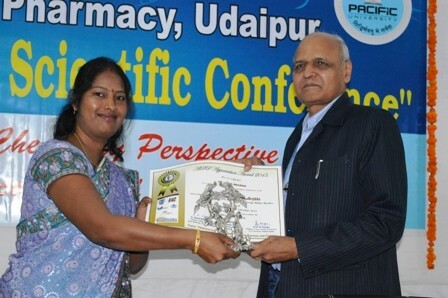 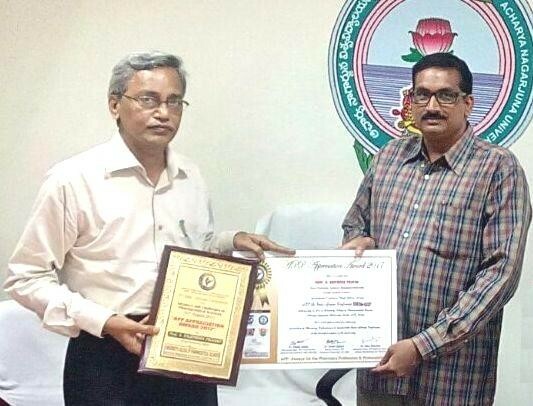 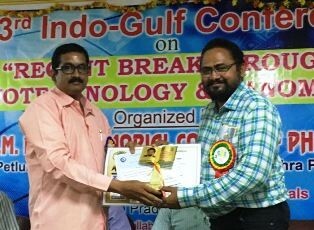 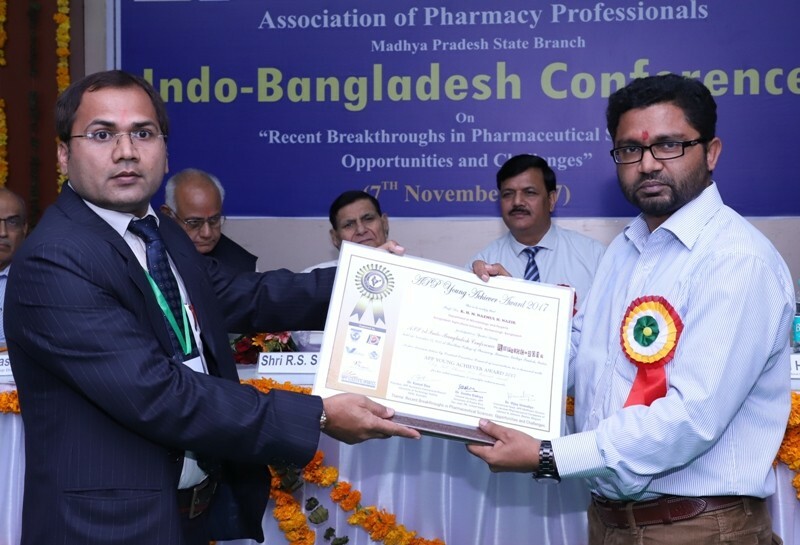 In orations, in pharmacology section, first prize was won by Dr. Kakali Bhadra, Assistant Professor, Department of Zoology, University of Kalyani, West Bengal. 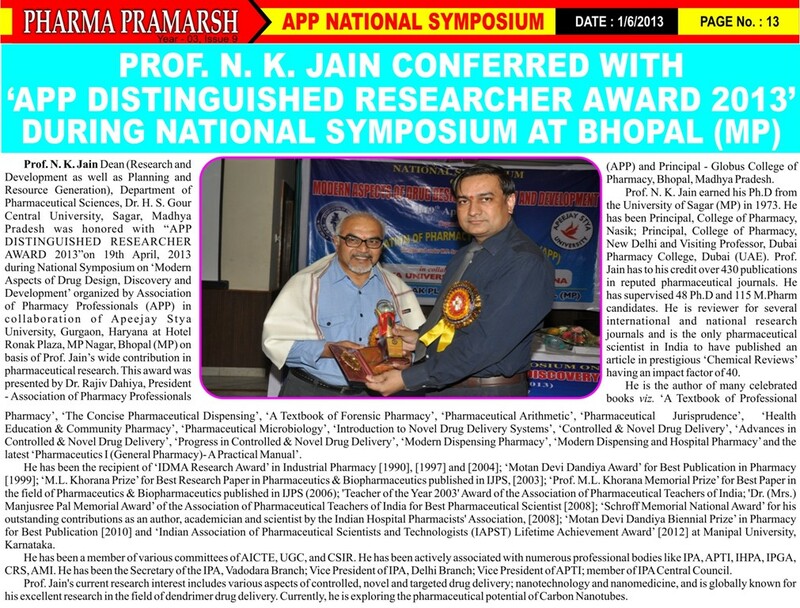 Dr. Kakali Bhadra gave oration on topic “Pharmaceutical effect of Harmalol, a Natural Product in HePG2: In Vitro Cytotoxicity and Binding Study”. 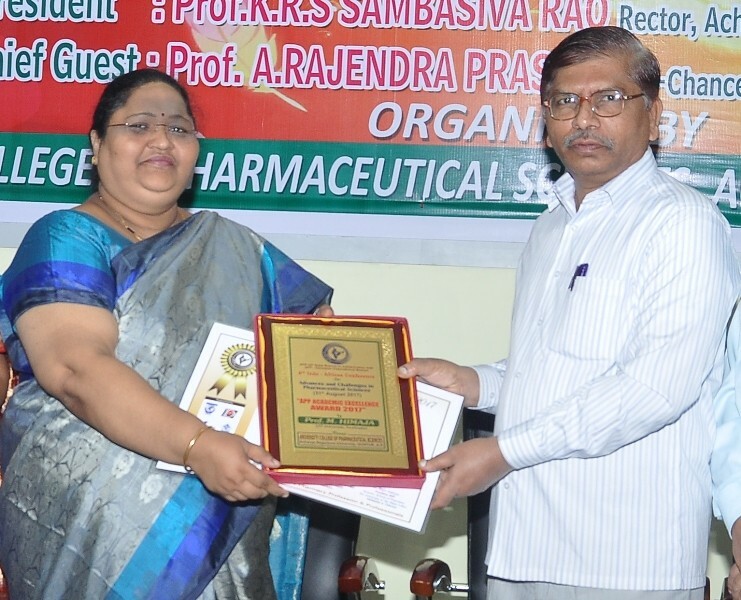 In pharmacology section, second prize was won by Ms. Vasanthi M. from Kamraj College of Engineering and Technology on the topic “In Vitro Evaluation of Alpha Glucosidase and Alpha Amylase Inhibitory Property of Bioflavanoids Extracted from Oxalis Lorniulata” and third prize was won by Mr. Anant Achary from Kamraj College of Engineering and Technology on the topic “Extraction Sucrose containing Sulphated Polysaccharides from S. Tennari Mum and Its Anticoagulant and Antioxidant Activity”. 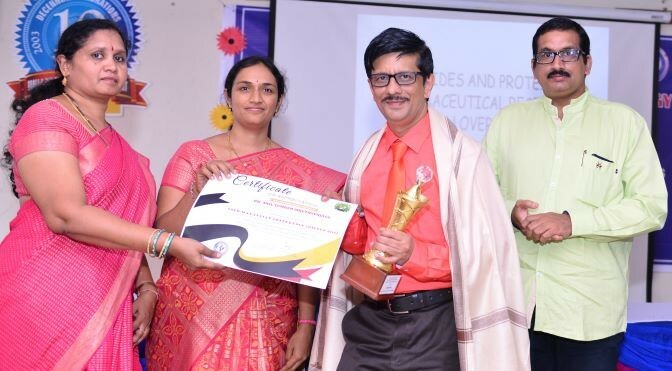 In pharmaceutical chemistry section, first prize was won by Mr. Ashish Bhaumik from Teja College of Pharmacy, Nalgonda, Telangana on the topic ‘Synthesis, Molecular Characterization and Evaluation of In Vivo Hepatoprotetive Activity of Some Novel Oxadiazole Derivatives‘. 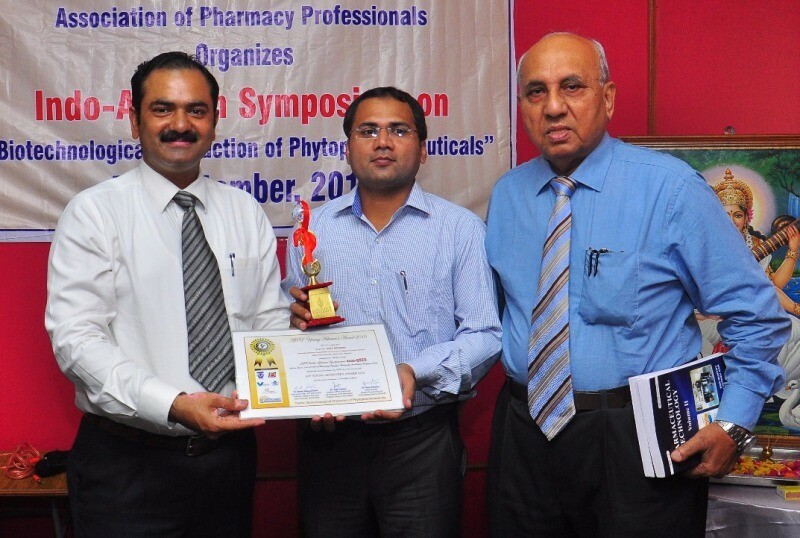 In pharmaceutical technology section, first prize was won by Mr. Devanand S. from Department of Cellular and Molecular Biochemistry, Dr. K. M. Cheriyan Heart Foundation, Chennai on the topic “Detection of Anti-hyperglycemic Trace Elements in Polyherbal Formulation by Asemax and LIBs Analysis” whereas in biotechnology section, first prize was won by Mr. Kanna K.P. 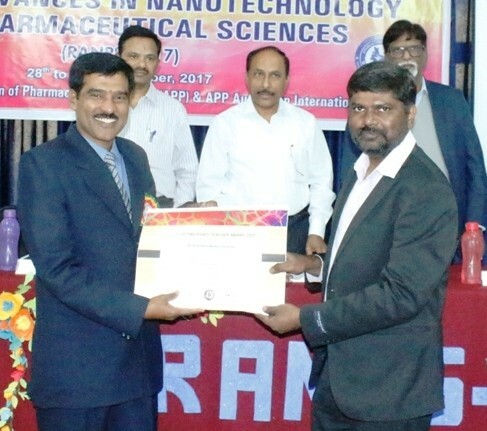 from Bannari Amman Institute of Technology, Sathyamangalam, Erode, Tamil Nadu on the topic “Extraction, Estimation and Characterization of Biomolecule from Endophytic Fungi”. 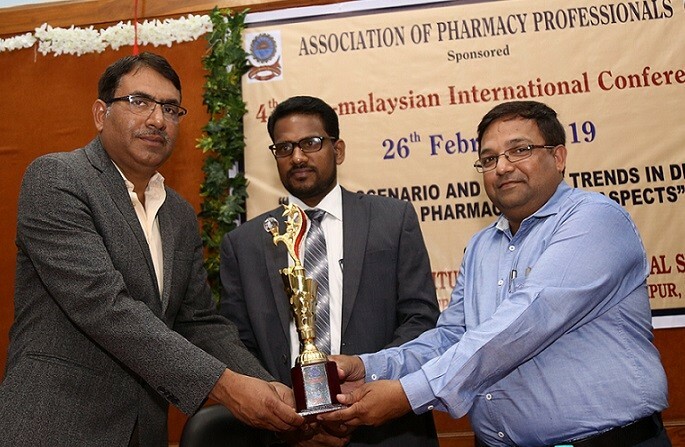 In biotechnology section, second prize was won by Mr. D. Anand from Department of Cellular and Molecular Biochemistry, Dr. K. M. Cherian Heart Foundation, Chennai on the topic “Adib, A Polyherbal Formulation Atters Gluco- toxicity Induced mRNA Expression in RINSF Cells – An In Vitro Study”. 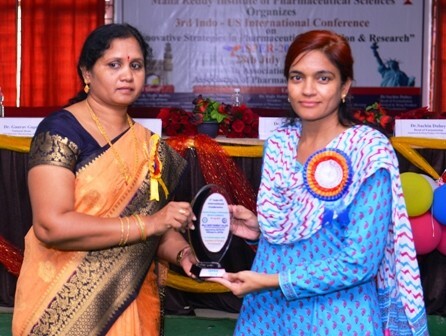 Finally, vote of thanks was given by coordinators of APP 5th Annual International Convention Dr. P. Selvamani and Dr. S. Latha, Assistant Professors, Department of Pharmaceutical Technology, Anna University, BIT Campus, Tiruchirappalli, Tamil Nadu. 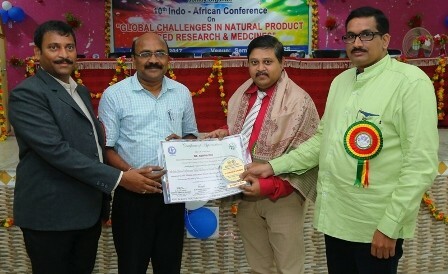 The programme was concluded with announcement of APP 6th Annual Convention to be hosted by Acharya Nagarjuna University, Guntur, Andhra Pradesh in January 2017 by Dr. Suresh V. Chennupati, President, APP Andhra Pradesh State Branch and Principal, Green Royal Academy of Pharmaceutical Education and Sciences, Koyyalagudem, West Godavari, Andhra Pradesh, India .